Before I start to analyze my game, I’d like to apologize for not getting a blog post at my usual 9 AM time. With the craze that is college exams before Thanksgiving and preparing to take off to Philadelphia for the National Chess Congress, I’ve been extremely busy. That being said, this will be my only post or video this week on chess^summit since most of my Thanksgiving holiday will be consumed by the National Chess Congress, my first GoFundMe sponsored tournament appearance. After a month, my GoFundMe Campaign has raised over $500, and will go a long ways towards preparing me for the US Junior Open this summer. I’m really thankful to everyone who’s donated, and I look forward to sharing more quality games with all of you for the next few months to come. 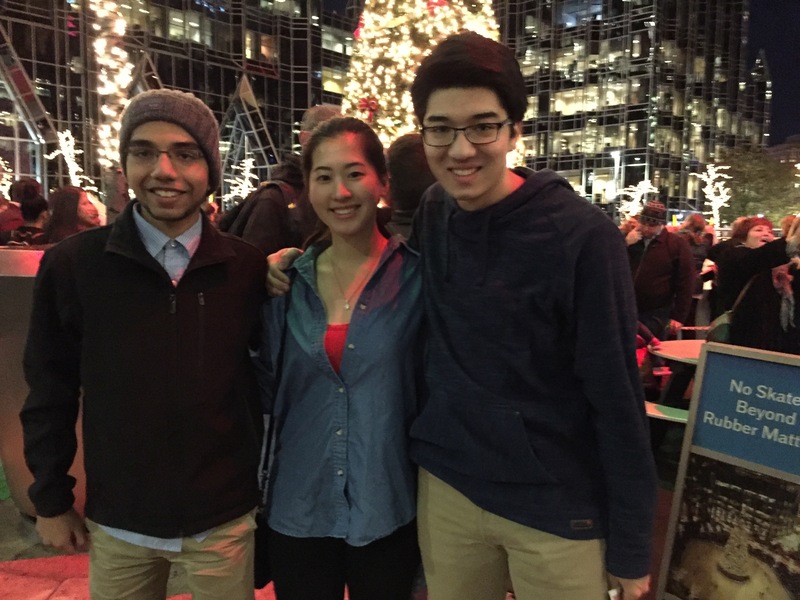 After having lived here for a few months, I’m finally starting to get in the habit of calling Pittsburgh home! My friends are just one of the few things I’m thankful for this Thanksgiving. My match-up tonight at the Pittsburgh Chess Club lasted only an hour, but I thought that there were some instructive points about dynamic play that were worth sharing. Just like last week, another seemingly unambitious bishop move, but in this position, White plans on playing Bd2-c3 to contest the long diagonal. 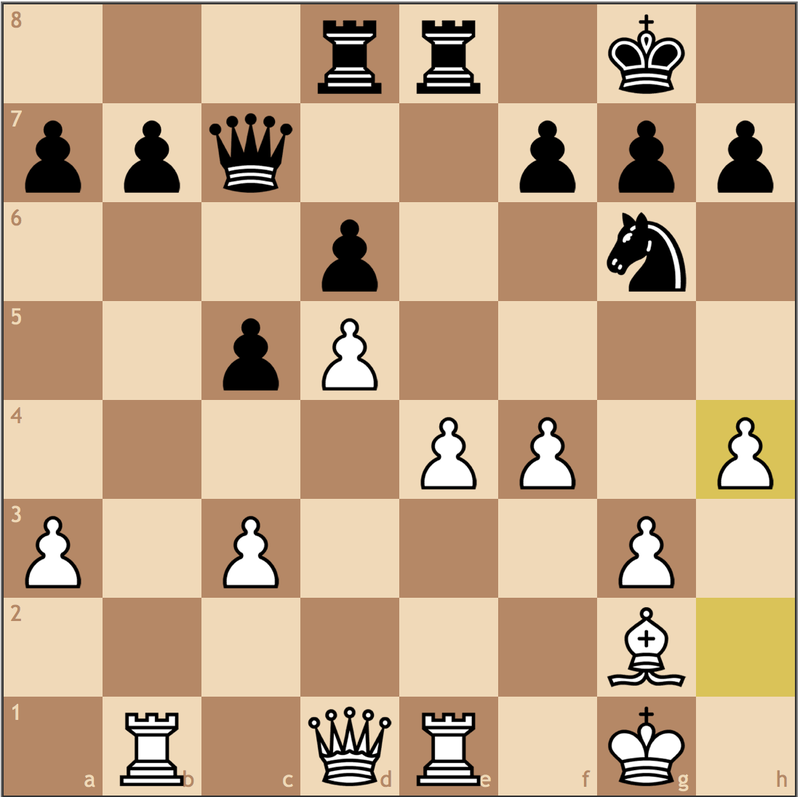 Not a blunder by any means but this move doesn’t make sense given the pretense of White’s last move. 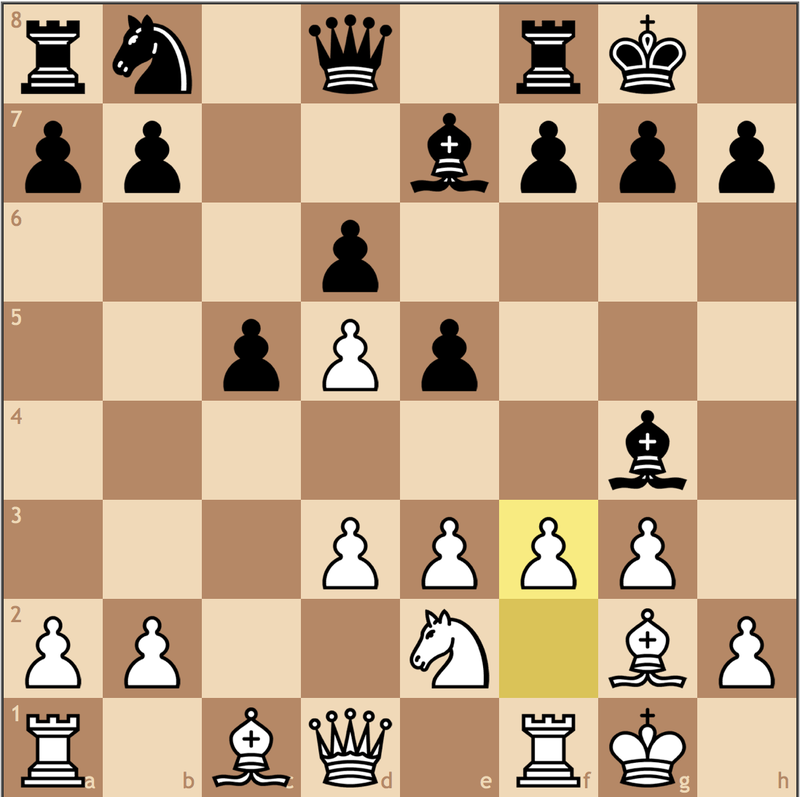 Without the option of Bd2-c3, the queen’s bishop is now misplaced on d2. If White had tried 7. Bc3, I had prepared 7… Nf6 8. e5 Nd4 and it’s Black who has a comfortable position – White’s e-pawn is hyperextended and his development is rather poor. I made this move rather quickly for the obvious reason to attack b2 and seize the half-open file. 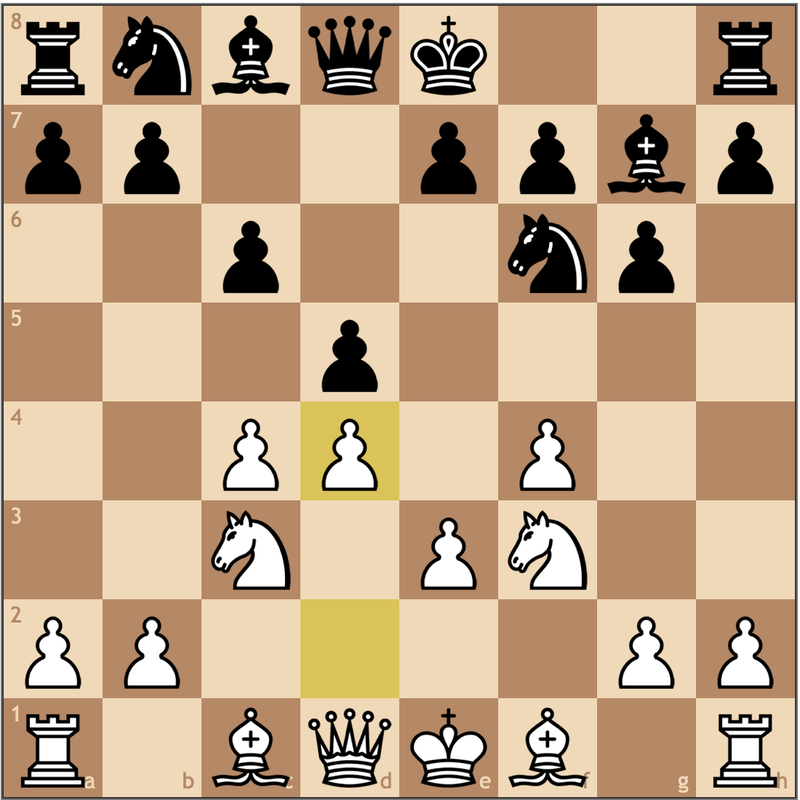 While this move is strong, I wish I had considered the more choice precise 7…d5! taking the center and taking away the c4 square for White’s bishop. I was taken aback when I saw this move, and I was reminded of a game I played back in 2014 against Ilya Kremenchugskiy in the Virginia Closed Chess Championships. 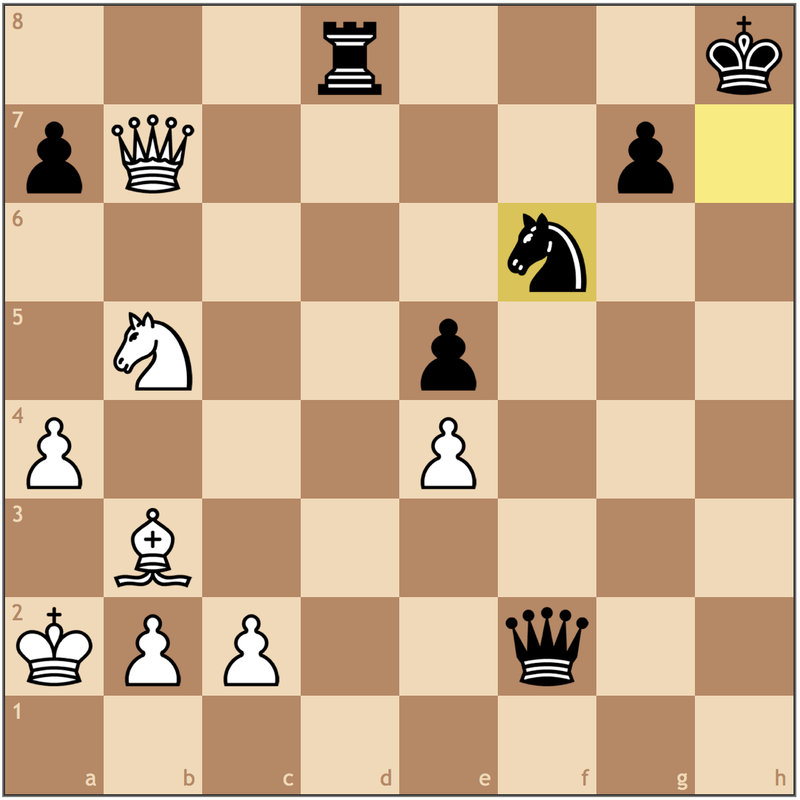 When I see a move like this, I’m not really phased by White’s aggression as all of my moves have been very principled. 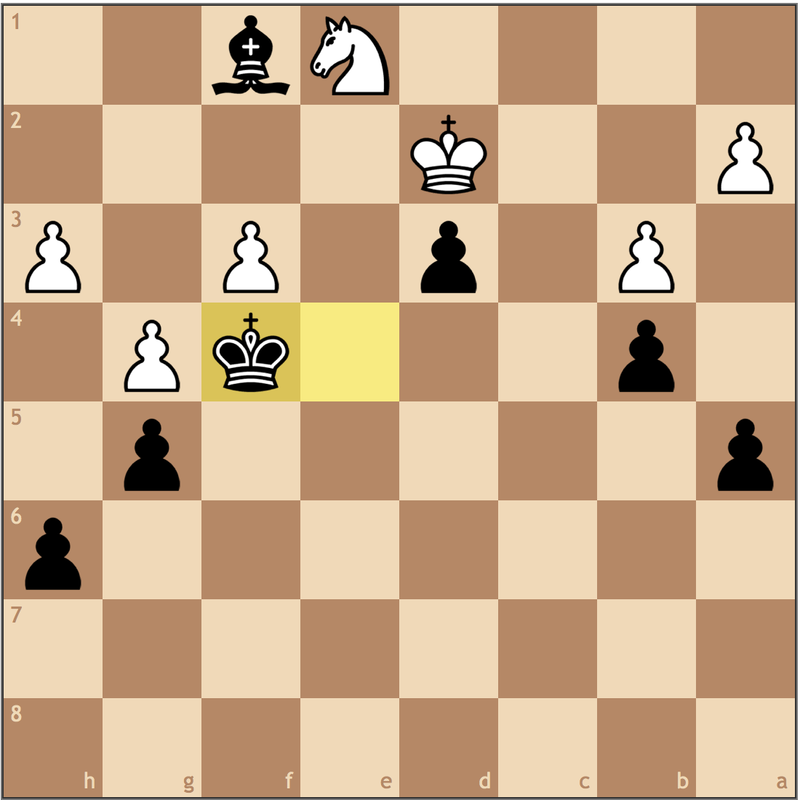 Though there may have been some improvements for Black, I haven’t made a “wrong” move either. If I continue to play solidly, then my opponent won’t be better in the long run. While this logical deduction doesn’t include lines like it should, it’s a good technique to have in much shorter time controls (G/15, etc). 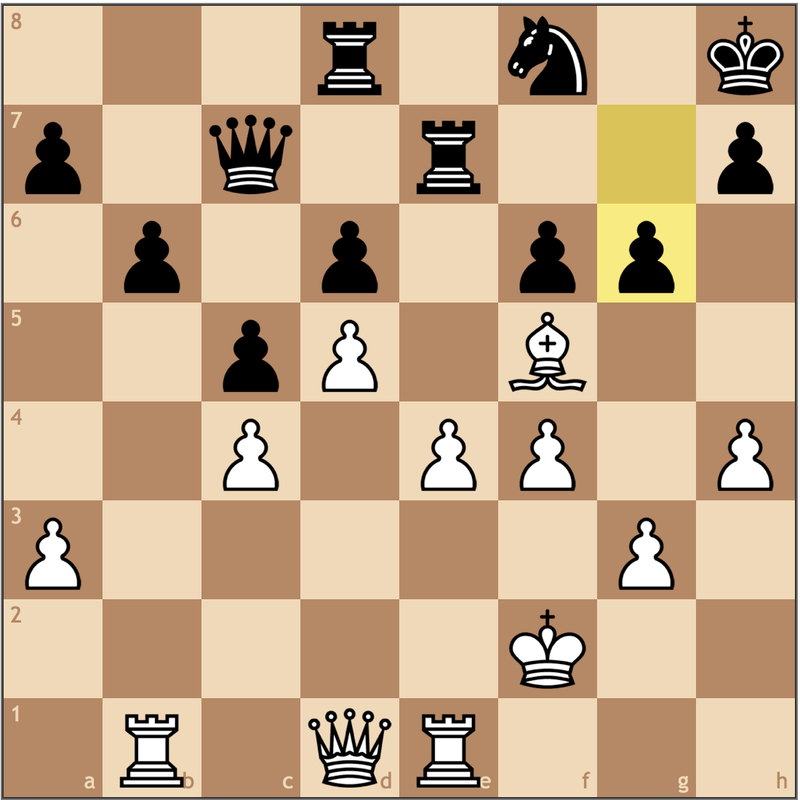 Knowing that my opponent’s play was unimpressive, I focused on how to punish him rather than how to defend. This is not a position I had studied prior to the game, so this did initially discomfort me. So what can I take away from my position? 1) My pieces are better coordinated. While the pawn on e5 blocks in my bishop, my d7 bishop, queen, and rook are all ready to attack the queenside. 2) Though my pawn structure is worse than White’s this would only be a bigger factor if I play passively or reach an endgame where my opponent has a 3 v 1 position on the queenside. In other words, while I have an uncomfortable position, if I can coordinate my pieces now I still have an opportunity to seize the initiative. In my estimation, this game is still equal right now. Perhaps this is the first real sign that something’s gone wrong. White didn’t want to castle queenside because of the b-file, but rather than moving the d2 bishop to a more active square (thus allowing White to castle kingside), this move offers a passive threat of a discovered attack. With the ball in my court, I took note of a few things. 1) I really want to attack the kingside with my queen, but the white queen takes away both b7 and g4. 2) I have potential targets on b2 and g2. 3) White hasn’t castled. With this in mind, I played the next two moves to highlight all three of these weaknesses. Mission Accomplished! When you see a weakness, you have to believe that there is a solution to exploit it – a concept highlighted wonderfully by GM Daniel Naroditsky. I had to take advantage of this single opportunity, or in all likelihood I’m fighting for a draw. Not to say I’m worse, but by trading the bishops on d7 earlier, I’m one step closer to an endgame, which is the one thing I don’t want. If White had taken on e7, he runs into some tactical problems after …Rf8-e8 and then …Rb8-d8, as the knight, the bishop, and the rook, could all be vulnerable to different tactics. Again, pushing the advantage with another dynamic move! With …Rb8-b2 coming, or perhaps …Rd8-d3 coming, White is extremely tied down, and it becomes extremely difficult to find moves. If White tries 21. 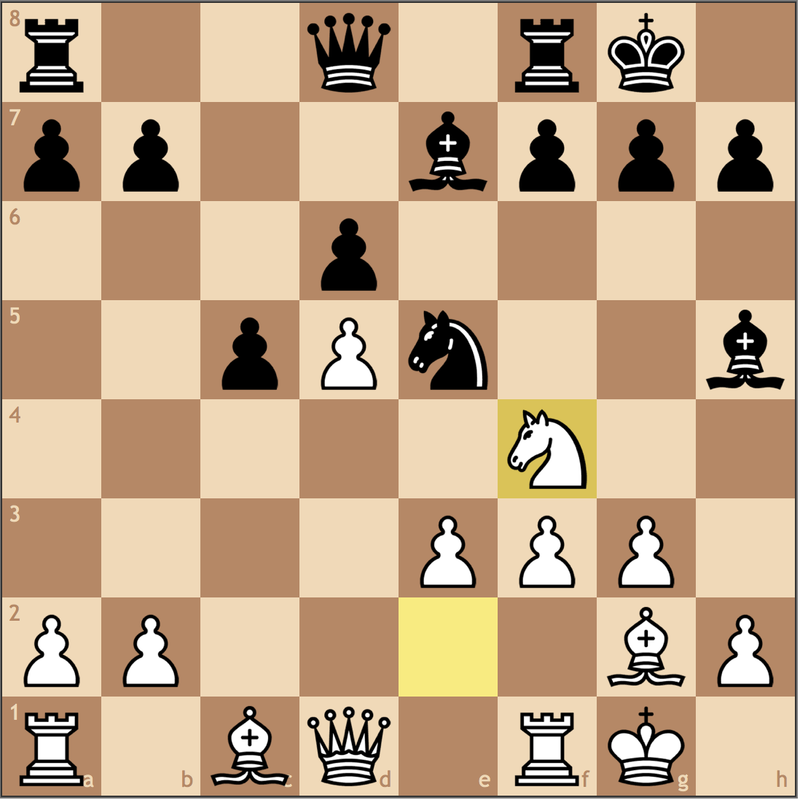 Qxe5, then 21… Ng4 and 21… Nh5 are both nice options (not 21… Rxd2?? 22. Qxb8+ +-). 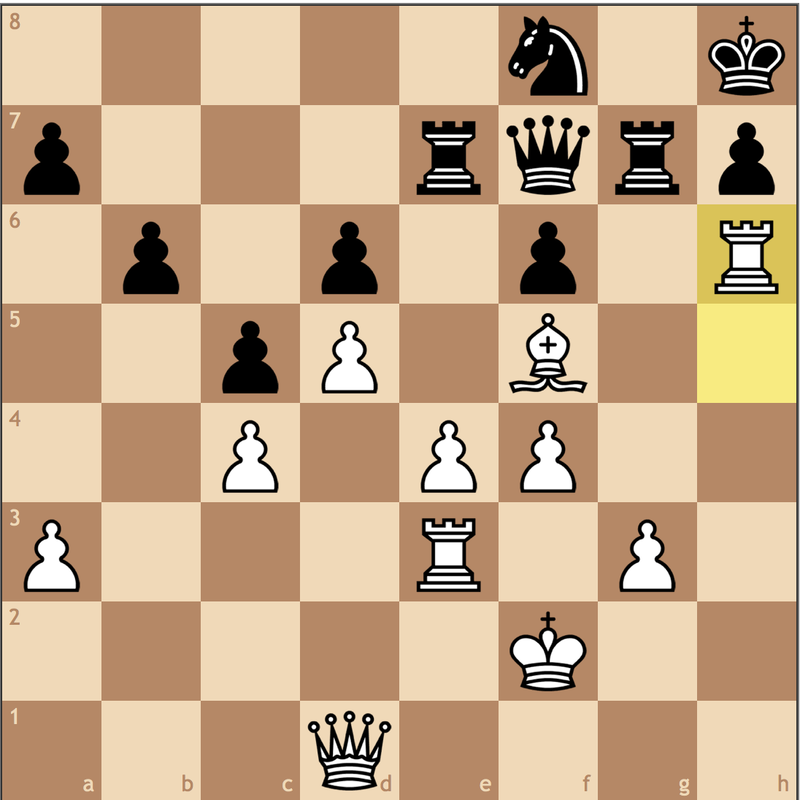 After a 10 minute think my opponent played this move and resigned before I could even assess the position. 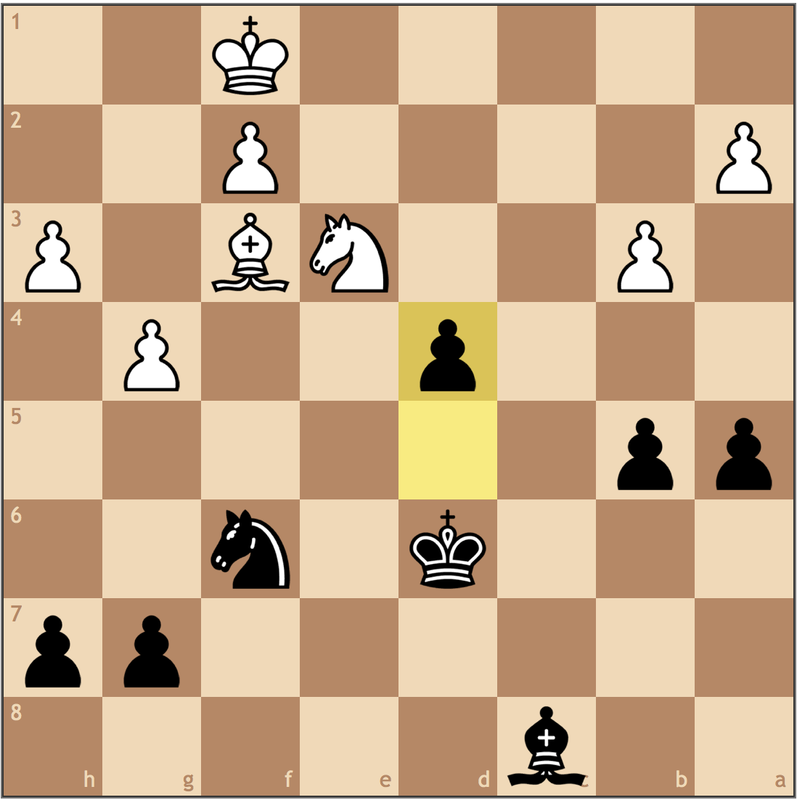 Black has 21…Rxb1 and the two minor pieces are better than the rook. I consider this a premature resignation, but White cannot play for a win. An interesting game where my opponent took unorthodox measures to try to get an advantage. While he caused some structural weaknesses, moving the queen around the board and not completing development effectively ultimately lead to my opponent’s demise. This was not a “pretty” win by any means, but it’s definitely another reason to be confident heading into the National Chess Congress’ Open section on Friday. I’m not exactly sure what to expect, but it would be nice if for my next post I could be an official Candidate Master by earning my last norm! Faced with a worse opening set-up, I managed to equalize in a G/15 ICC match after trading my weakest pieces for my opponent’s best pieces. 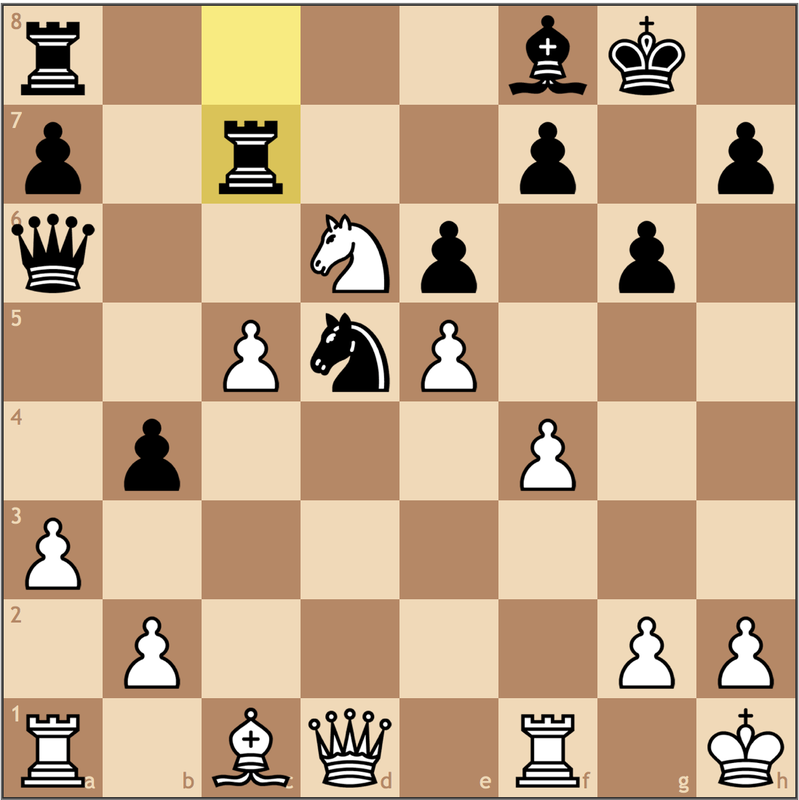 At the critical moment, I used an idea from Yasser Seirawan to earn the half point – watch the video and check it out! Over the last few weeks, I’ve been playing in a bi-monthly ladder at the Pittsburgh Chess Club, and if I have to be honest, the change in tournament format hasn’t been the smoothest for me, as late night Tuesday rounds has pushed my mental endurance. Despite winning the first round, I made an early mistake in the opening, which made most of the game an uphill battle. Round 2 proved to be much more difficult. Despite taking a material advantage in an endgame, I underestimated my opponent’s counterattacking chances and lost in a rather embarrassing fashion. So this last Tuesday was round 3, and to say the least, I needed a win – badly. My opponent, a much older player, had just drawn a strong expert despite his 1800 rating, and knowing some of his other recent results, I knew that this would be a tough fight. As always, I got to the board insanely early, ready to play the most important game I would have played since moving to Pittsburgh. 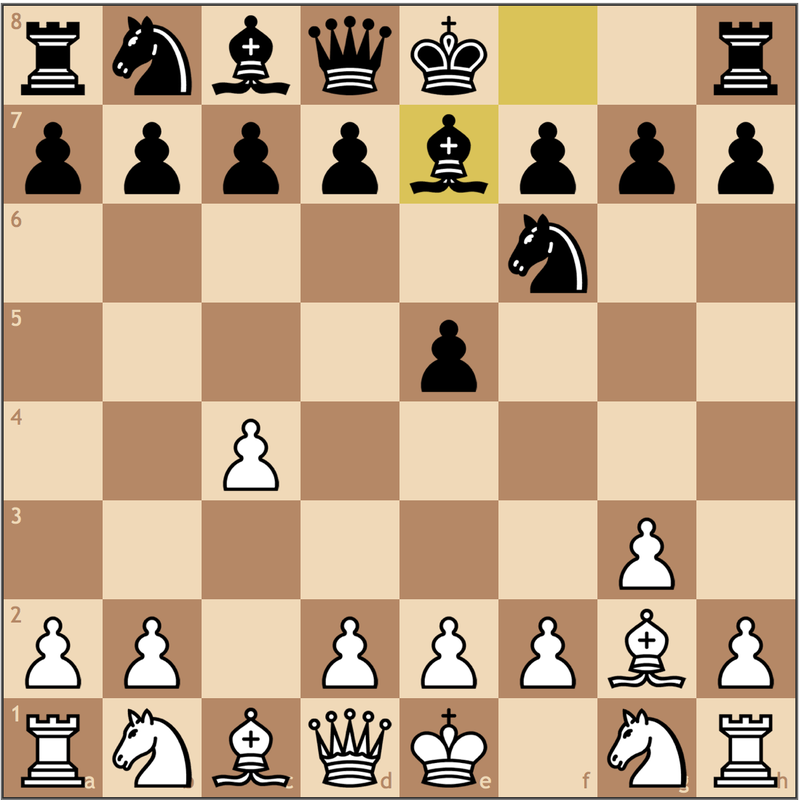 My opponent “doesn’t play openings” but even a novice should know that this move is ill-advised. While White stands slightly better, it’s important to note that this move alone won’t lose the game. 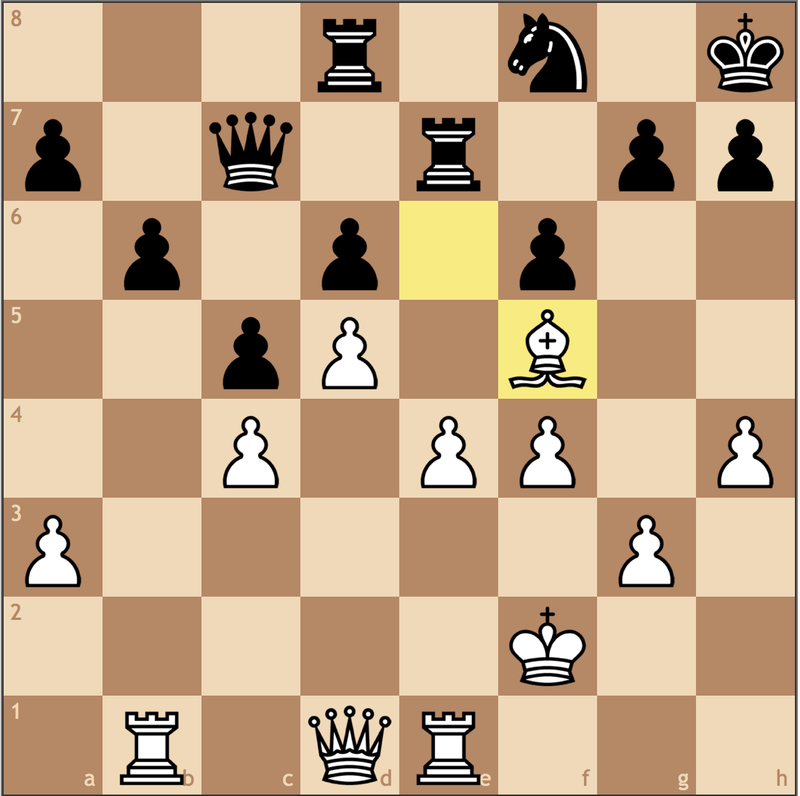 I would like to have the option of playing Ng1-f3, but that would allow …d7-d5, giving Black a Maroczy structure and somewhat justifying his move 3…Be7. If I want to castle, I’m going to need to determine the best square for my g1 knight. The square f3 isn’t bad, but my set-up is positioned to attack the d5 square. At first, I thought that 7. Nf3 0-0 8. Nd2 with the idea of Nd2-f1-e3 wouldn’t be so bad, but the problem is that Black has 8… Qa5! and now with the pin to my king, it’s not so clear why I wasted so many tempi to get my knight to d2. 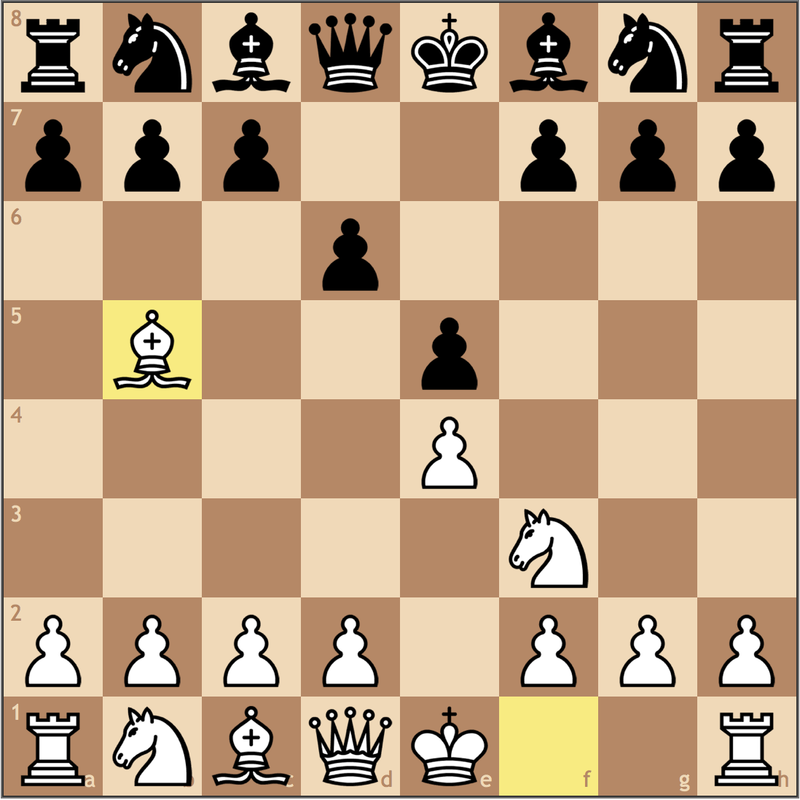 This is a much clearer plan, as 7. e3 allows me to play Ng1-e2-c3. 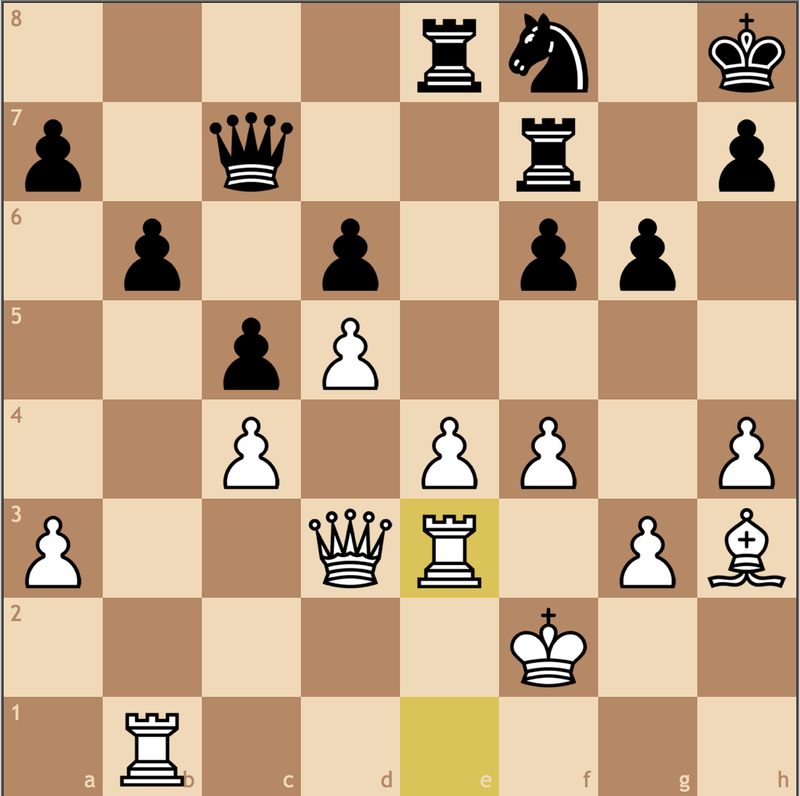 Believe it or not, taking with the pawn in this position is surprisingly theoretical. Here it’s even better because I can punish Black (finally) for 3… Be7, because it takes away the most natural square for the knight. 9… Nb4 runs into problems after 10. a3 Qa5 11. 0-0 because Bc1-d2 is coming and the b4 knight needs to retreat to a6. 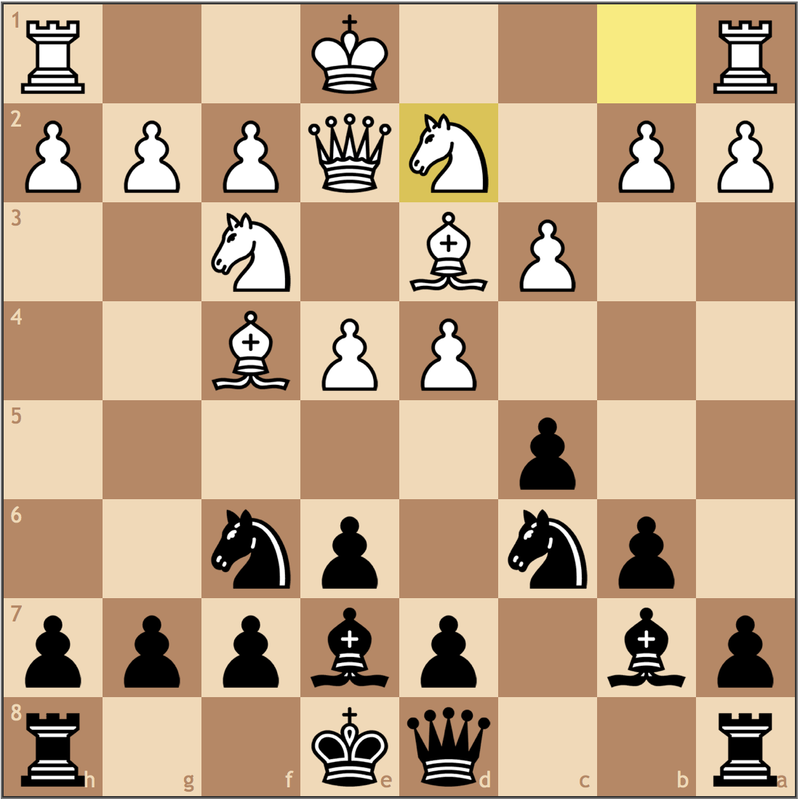 I want to play d3-d4 without having my knight pinned on e2, so this move felt natural. While I didn’t think much of it during the game, I think Black is strategically lost here once I break the central pawn structure. As you’ll notice, Black will not be able to generate counterplay for the remainder of the game. 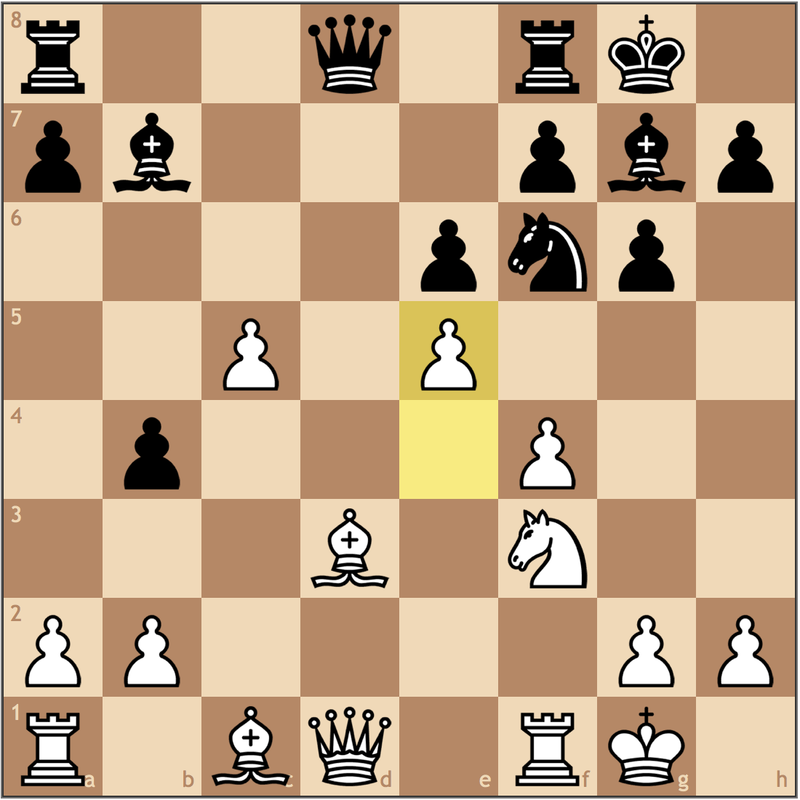 Maybe the best move, because after 12… cxd4 13. exd4 exd4 14. Nf4! (not 14. Nxd4 Qb6!) 14…Bg6 15. Qxd4 Bf6 16. 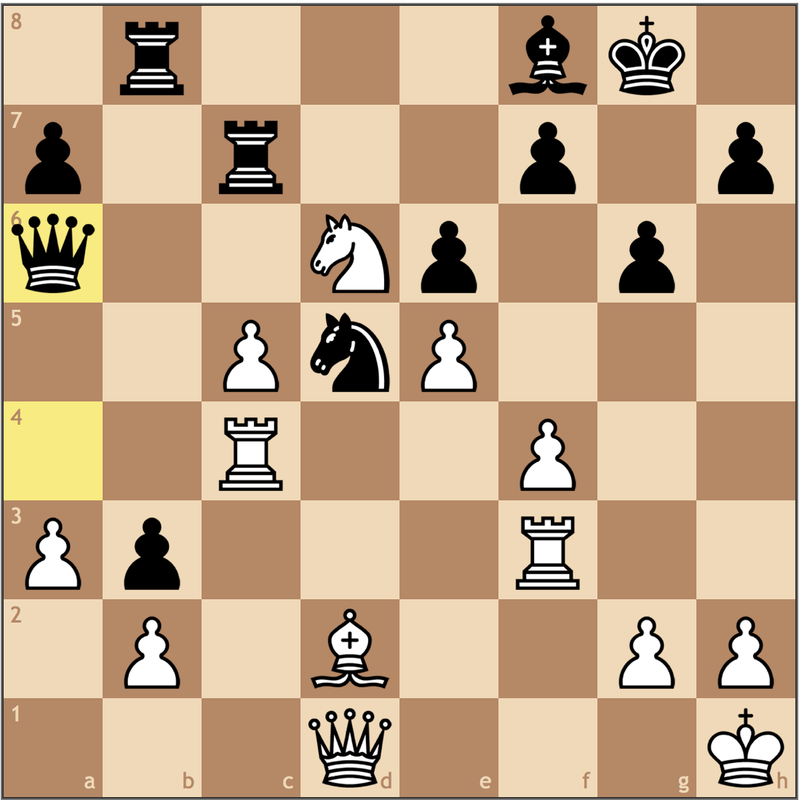 Qb4, White has a slightly better position with a plan to take on g6 and mount my bishop on f4. 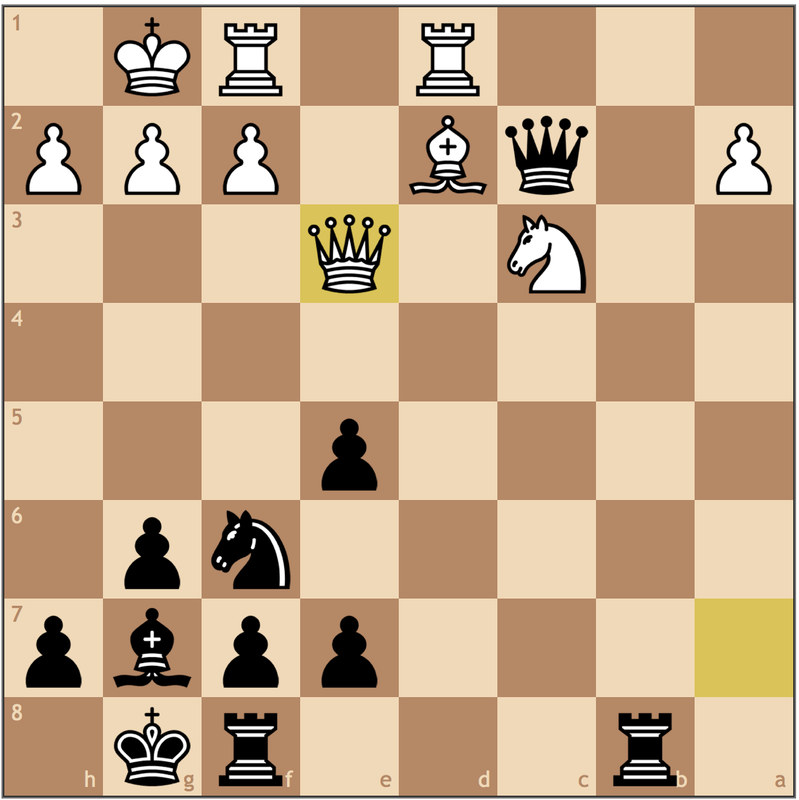 With Black deciding it was best to not give me a passed d-pawn, I get the f4 square for my knight and the bishop pair. With Black planning to play …Be7-f6, this move gets the rook off the long diagonal, while potentially planning a b2-b4 strike. 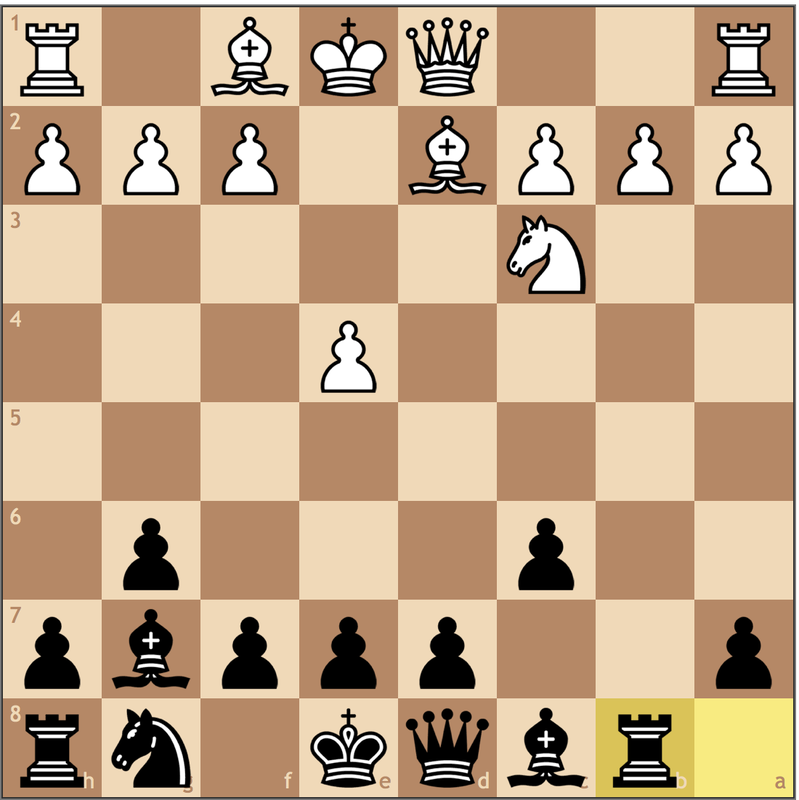 Black doesn’t have any dynamic options on the queenside as …b7-b5 will always be met with a2-a4, weakening Black’s structure (this is an important idea!). The most important move of the game. 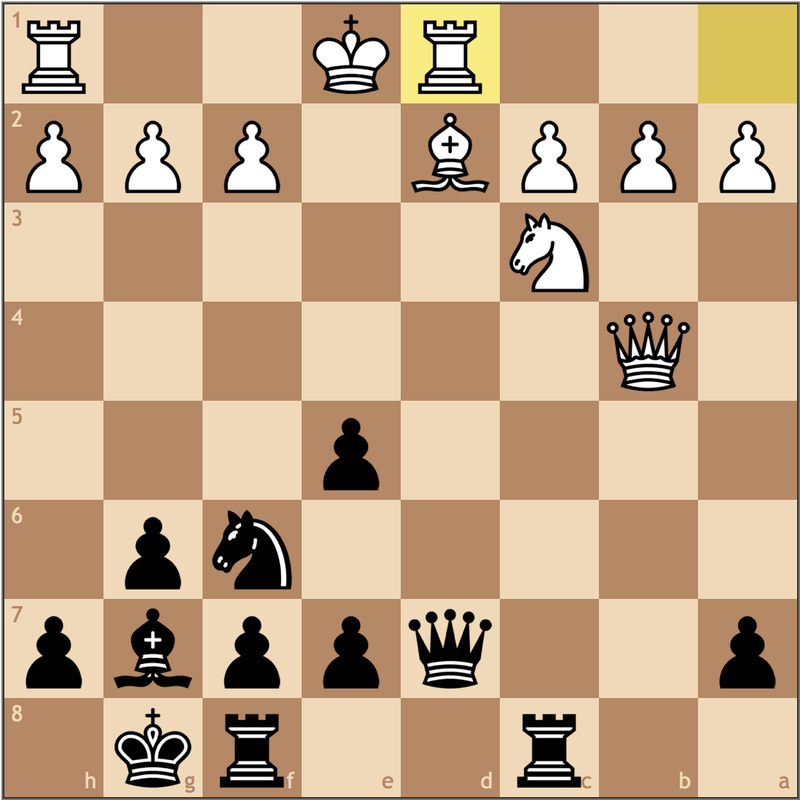 Both 17. e4 and 17. b4 are the most natural moves, but each gives Black counterplay. 17. b4 can run into tactical issues because after 17… Qb6, Black points out my limited coordination and weaknesses on e3 and b4. 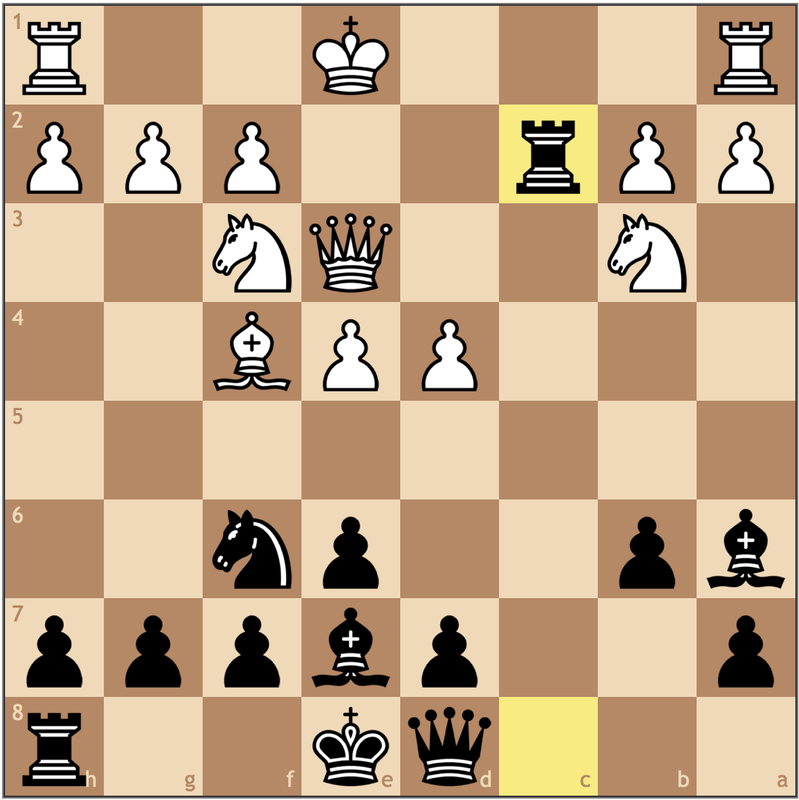 17. e4 is an easy move to make but after 17… Bf6, Black has control of the d4 square as well as the long diagonal. I need to get my bishop to c3 before pushing the e-pawn. 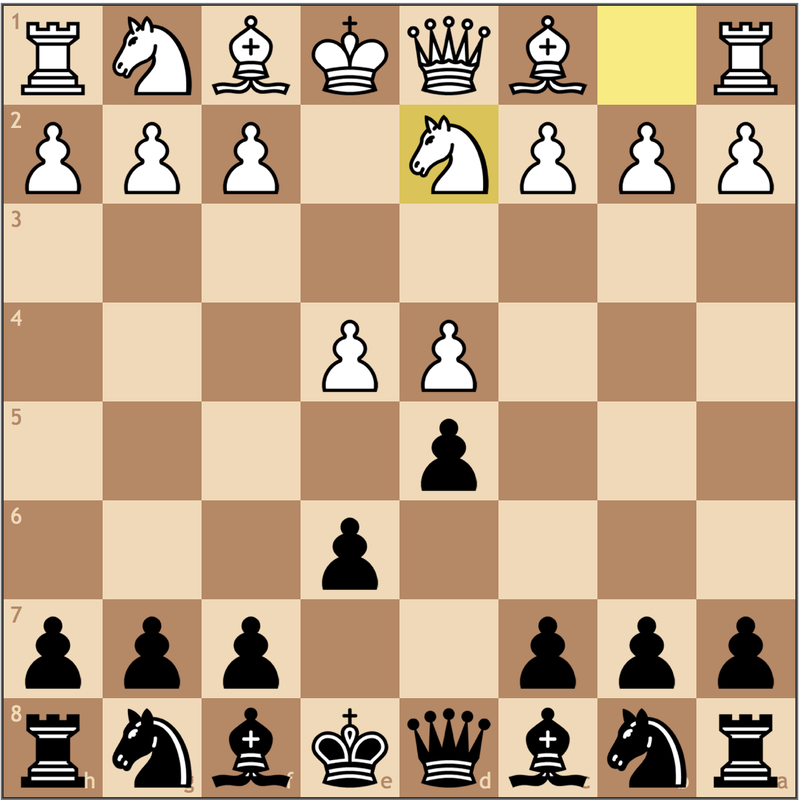 My move makes the most intuitive sense because it takes the e5 square away from the Black knight while also stopping any …h7-h5 counterplay. 17…Bf6 18.Re1 Qa5 19.a3 Ne7? 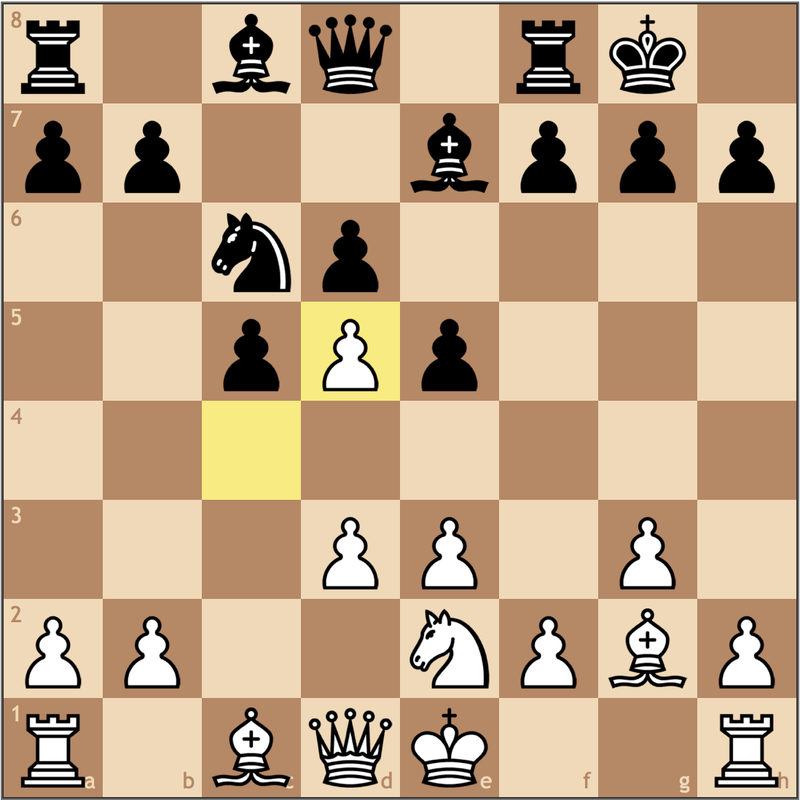 This move tries to maneuver the knight away from the bad g6 square, but in doing so cuts off the f6 bishop. This is important, as now I can force an advantageous trade on c3. 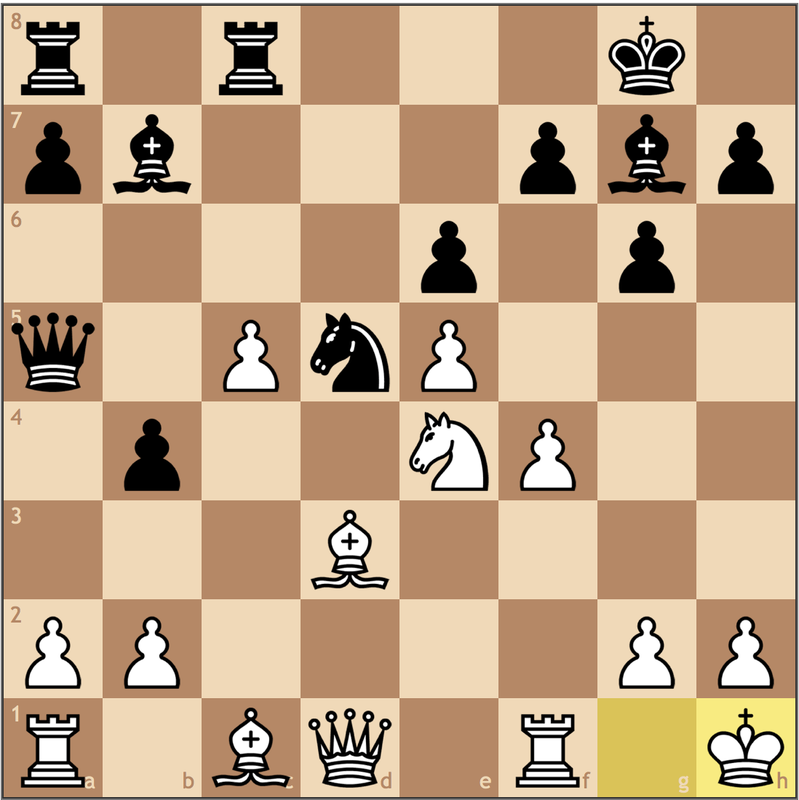 With a pawn on c3, I can play e2-e4 without giving Black counterplay. 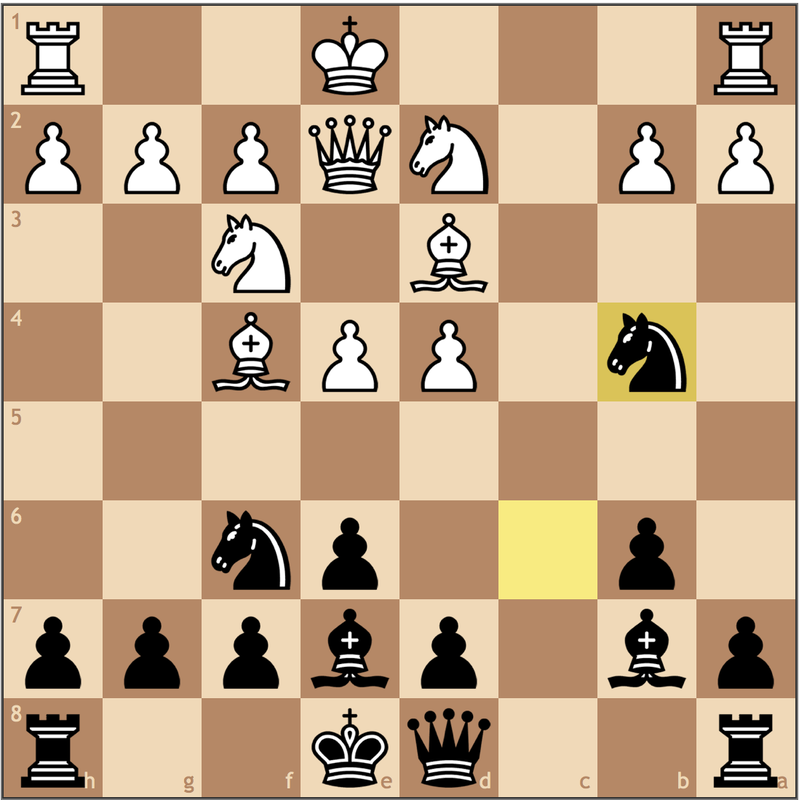 Pointing out that Black cannot play …h7-h5 to stop the h-pawn. 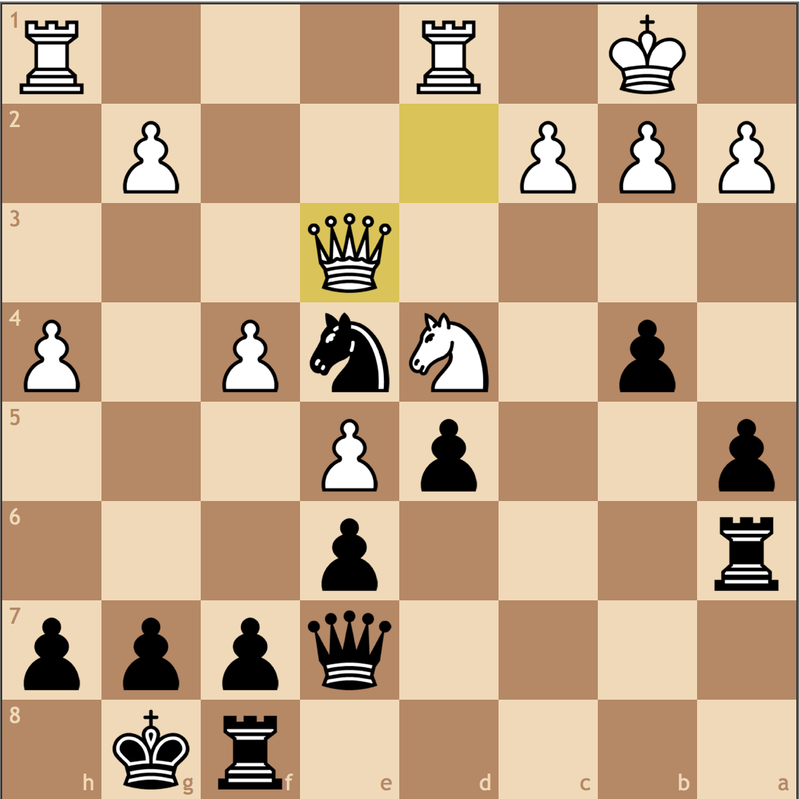 With no counterplay across the board, Black begins to falter. A positional blunder! My opponent weakens the e6 square, which will make for a great outpost for my bishop. While it looks difficult to penetrate Black’s fortress, my advantage lies in my light squared bishop. 25. Bh3 would have also been acceptable, but I liked this move more since it stops any chance for Black to have a dynamic break on the queenside. 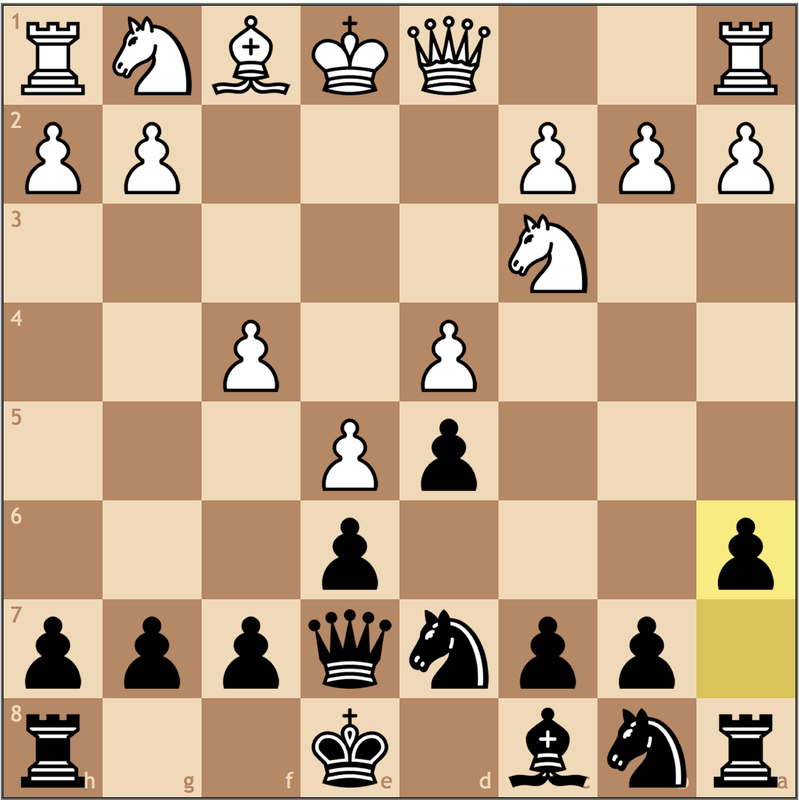 Because Black doesn’t have a piece that can reach d4, fixing the pawn structure furthers my advantage. 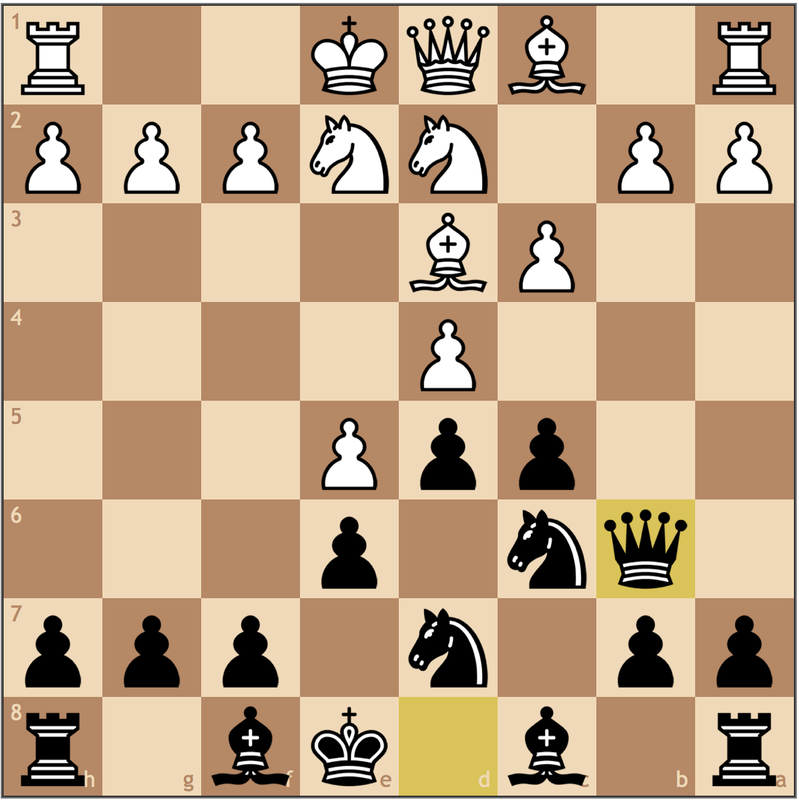 On his next move, Black will attack my e6 bishop, so I get one tempo for an improving move. By moving the king off the first rank, I open access to the h-file for my rooks. I thought it was important to put the king on f2 and not g2 because I figure Black’s only counterplay lies in …g7-g5, opening the g-file, this move gets my king out of the way in advance while giving me a chance to attack. 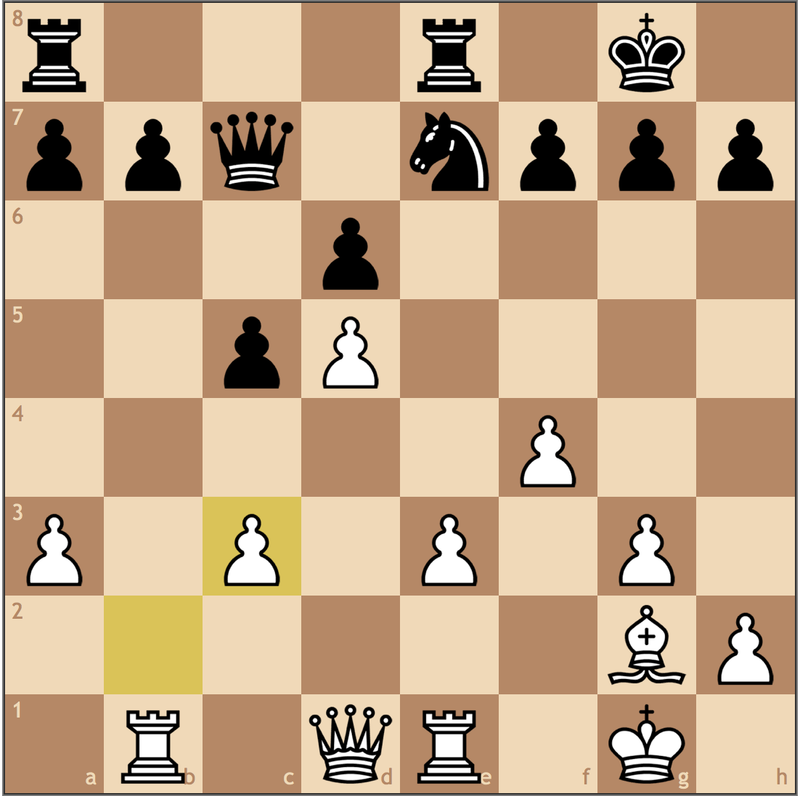 It’s important to not that 29. f5 loses all of White’s advantage. 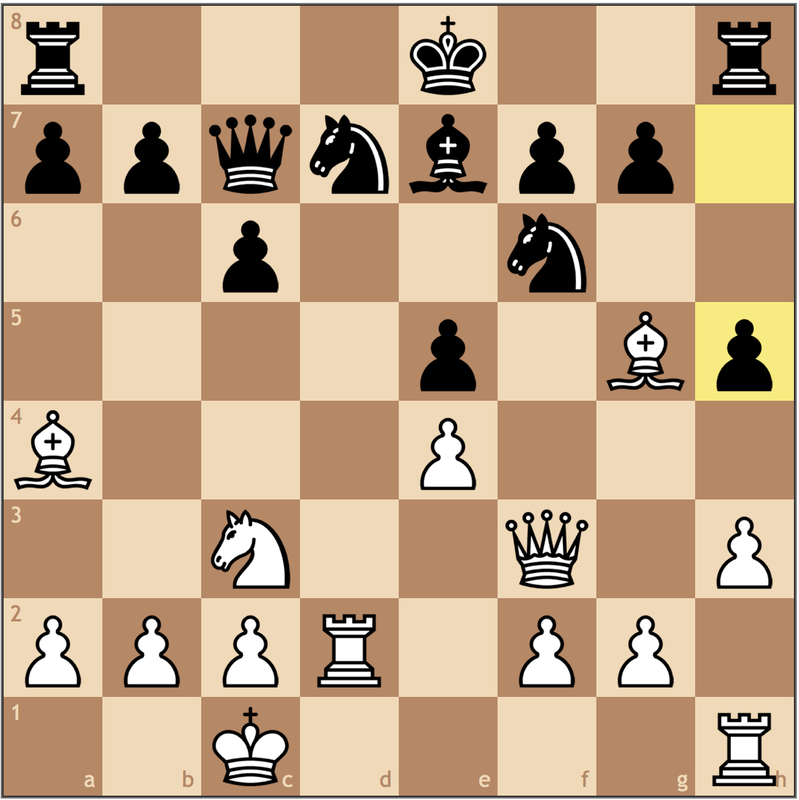 While 29… Nxe6 would give White a passed pawn, it’s in Black’s best interest to instead play 29… Nd7! with the idea of going to e5. Since my pawns can’t control dark squares once I push the f-pawn, I would have no way of recovering my bishop for knight advantage. That being said, there are two reasons why I am winning: 1) the bishop dominates Black’s weak light squares and the f8 knight has no scope and 2) the f4 pawn. The f4 pawn controls the most critical squares, e5 and g5, and is the main reason Black’s knight is contained (remember 17. f4! set this position by achieving this goal!). This seemingly innocuous move seals my opponent’s fate. When I played 29. 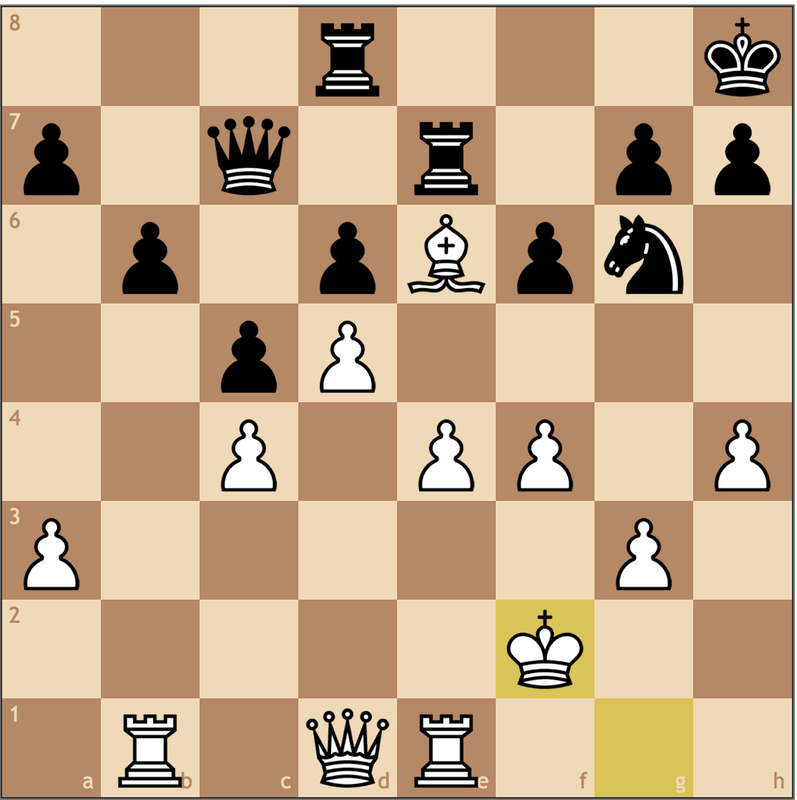 Bf5, I actually wanted to provoke this move (the bishop was solid on f5 regardless). 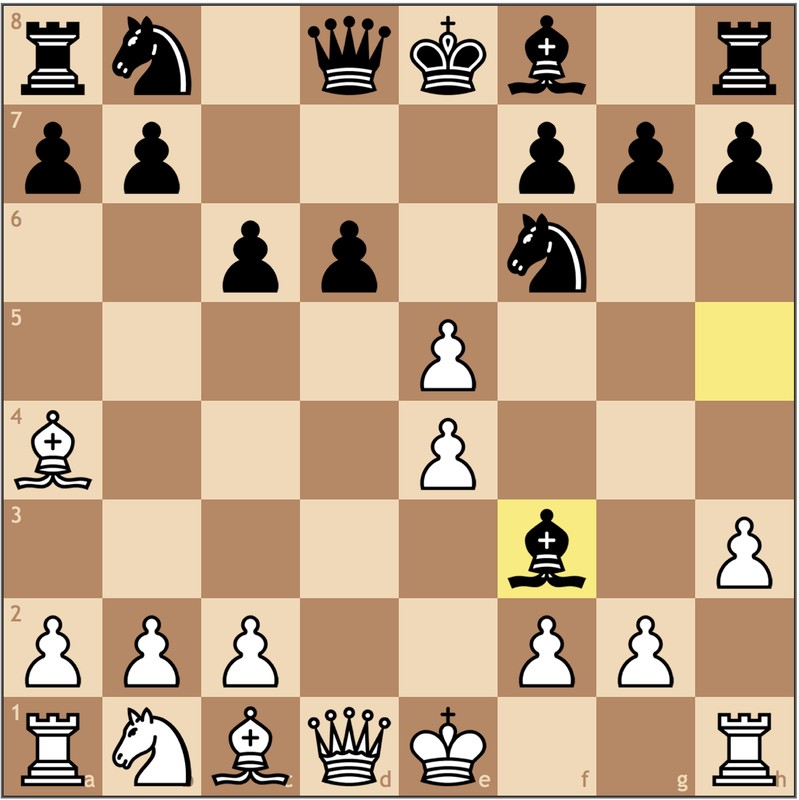 In this position, I really only have one target – the square on e6. I can push the a-pawn, but it’s not clear if opening the b-file really helps me yet. Now with this second weakness, I can apply the principle of two weaknesses. 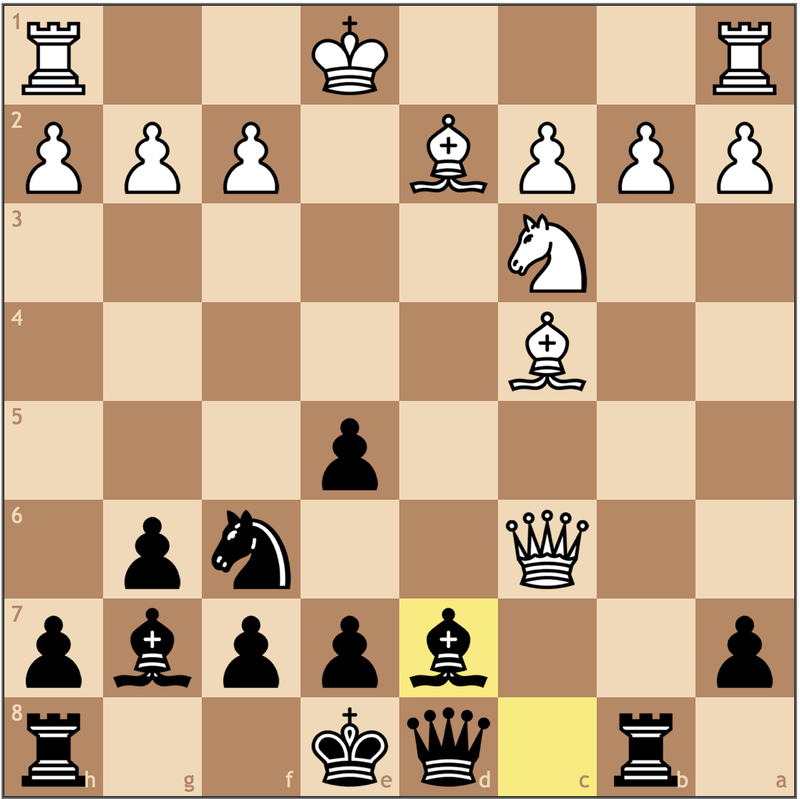 By playing …g7-g6, Black weakens the a1-h8 diagonal and the f6 pawn, while simultaneously giving me a hook on g6. This move serves multiple purposes. 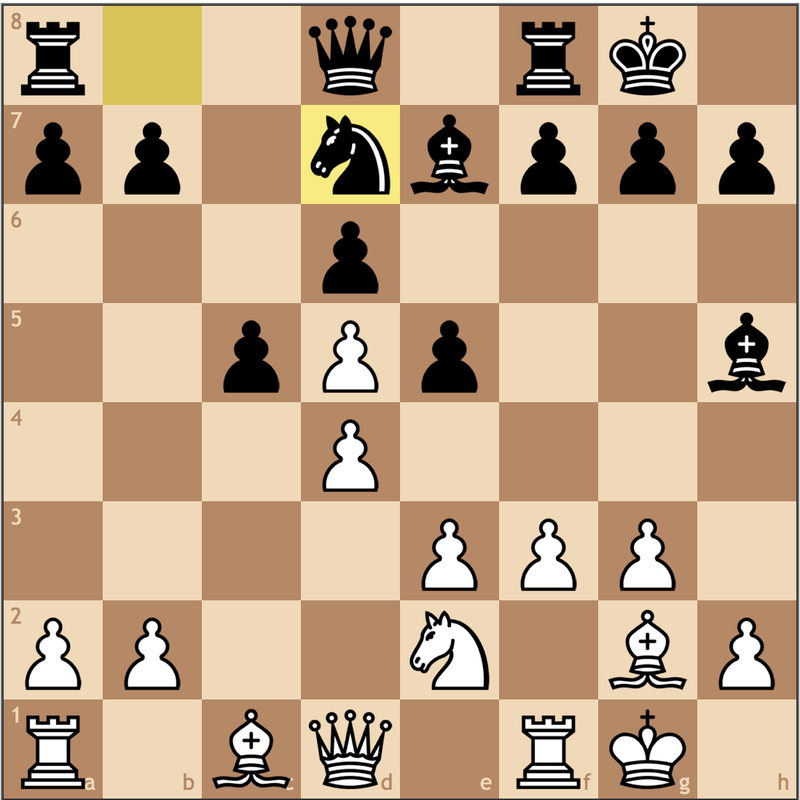 While protecting the e3 pawn, I give my b1 rook access to the h1 square. 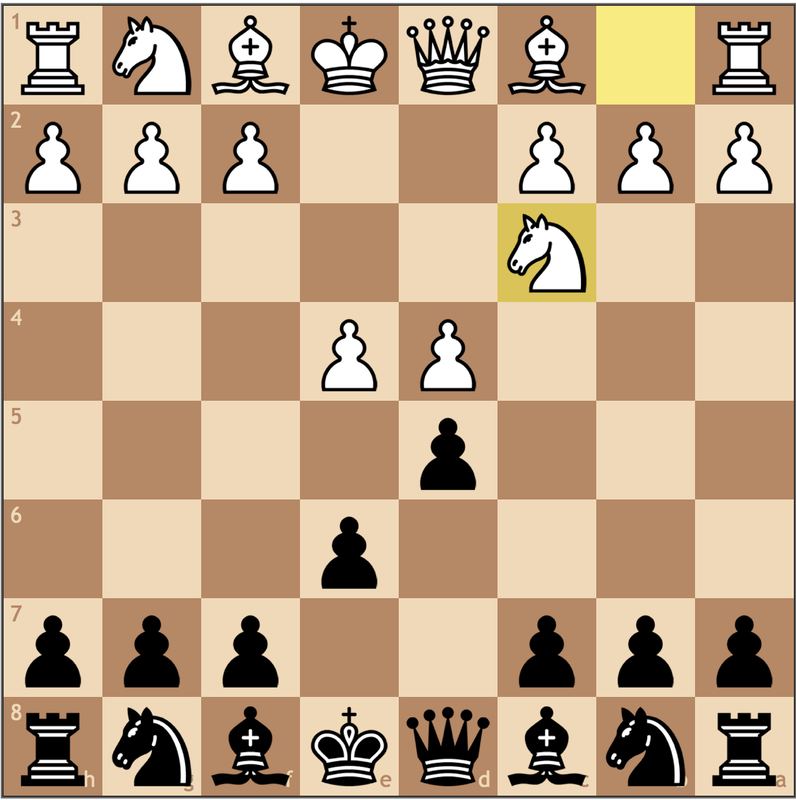 Furthermore, by creating a battery on the third rank, I’m prepared for Black’s …g6-g5 push to open the g-file, as I’ll have the option of Rg3 or Rh3 in such positions. Black really doesn’t have much going on, so I can take my time maneuvering. This move is my first attempt to break through the position. Though I do want to break open the h-file, my ultimate goal is to open f5 again for my bishop as a permanent outpost. The best defensive effort may be 33… g5 but after 34. Bf5 Black still has no play and would have to defend against an eventual Qd3-c3 followed by a potential f4xg5 plan, where Black’s king gets exposed. 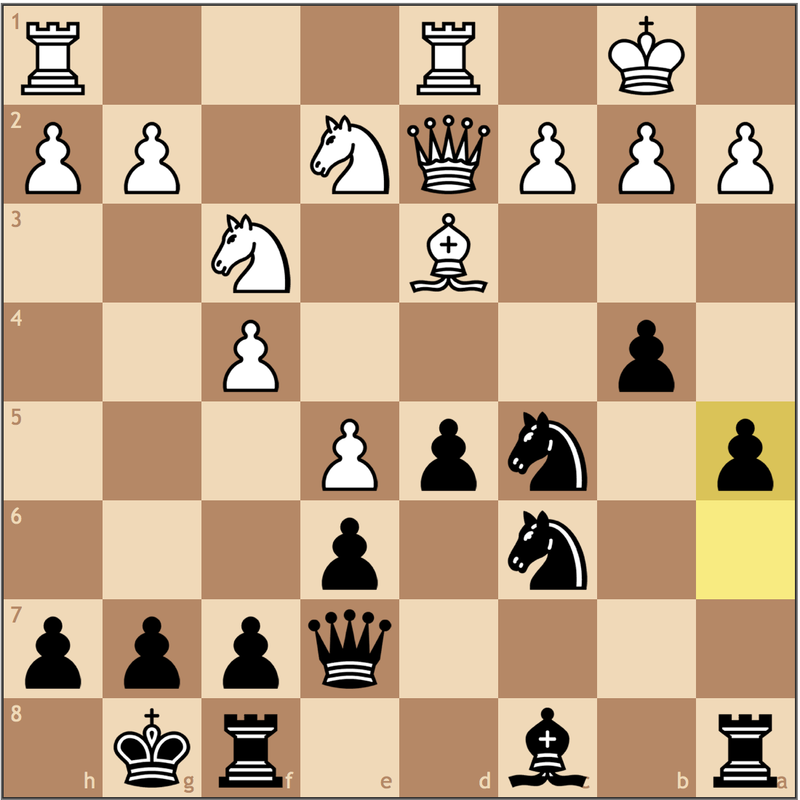 Putting pressure on f6 while sealing the kingside from Black’s army. My goal now is to play Qd1-a1 and Re1-h1. 38…Ng6 39.Qa1 Re8 40.Re1 Ne7?? 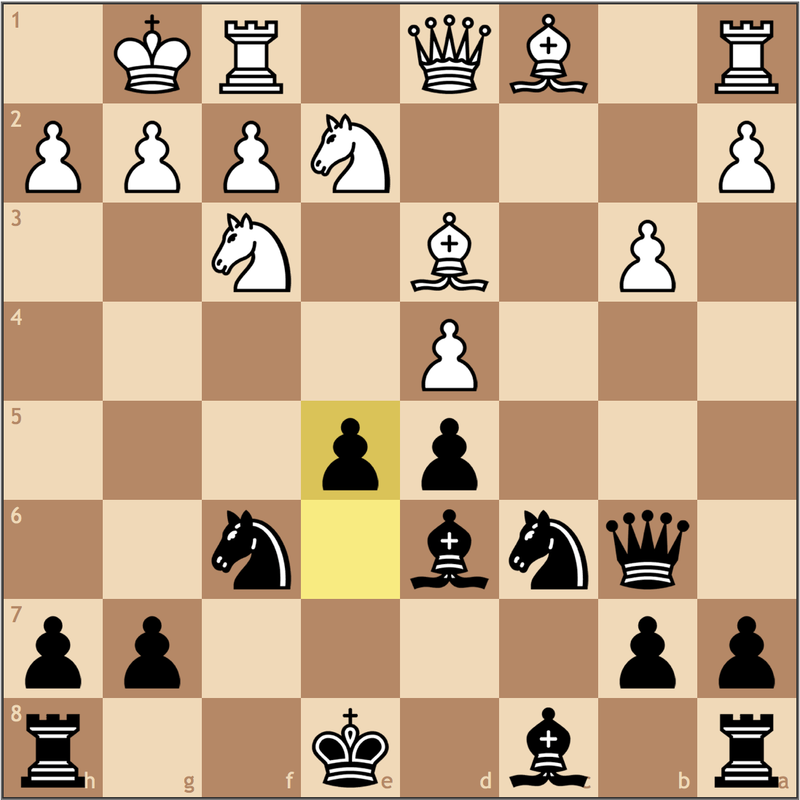 Black’s counting on me to take the f6 pawn to open up Black’s kingside but misses the winning blow 41. Be6 +-. Without this mistake, black’s still lost as he can’t simultaneously protect f6, h7, and stop the a-pawn push at the same time. 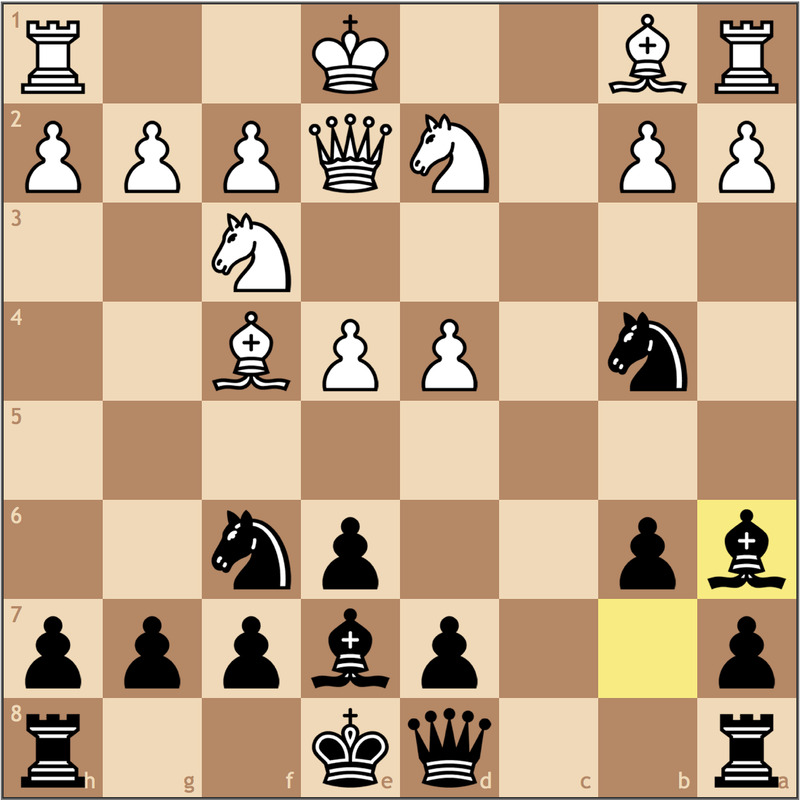 Black’s knight is still pinned to the f6 pawn, and his king is still under fire from multiple angles. I was really happy with the quality that I brought to this round, and it’ll be a big boost going into the National Chess Congress next weekend in Philadelphia. Black helped me along the way, but it’s difficult for me to find significant improvements for myself throughout the game. 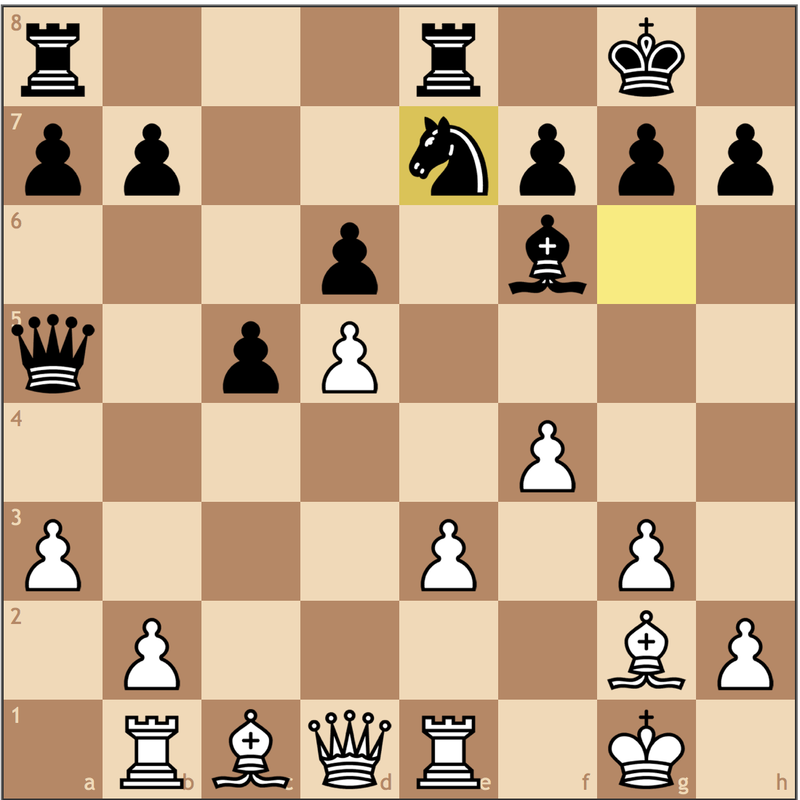 Over the weekend, I decided to play a G/15 quad, and even though I was easily able to reach a score of 2.5/3 (my quick rating is low, so I played mostly inferior opponents), I saw a game in the top quad that inspired me to write today’s post. Just as a disclaimer, I was in my second round game as this one was developing, so the move order may not be exact (the critical position will be reached regardless). This move 1… e6 is surprisingly flexible. 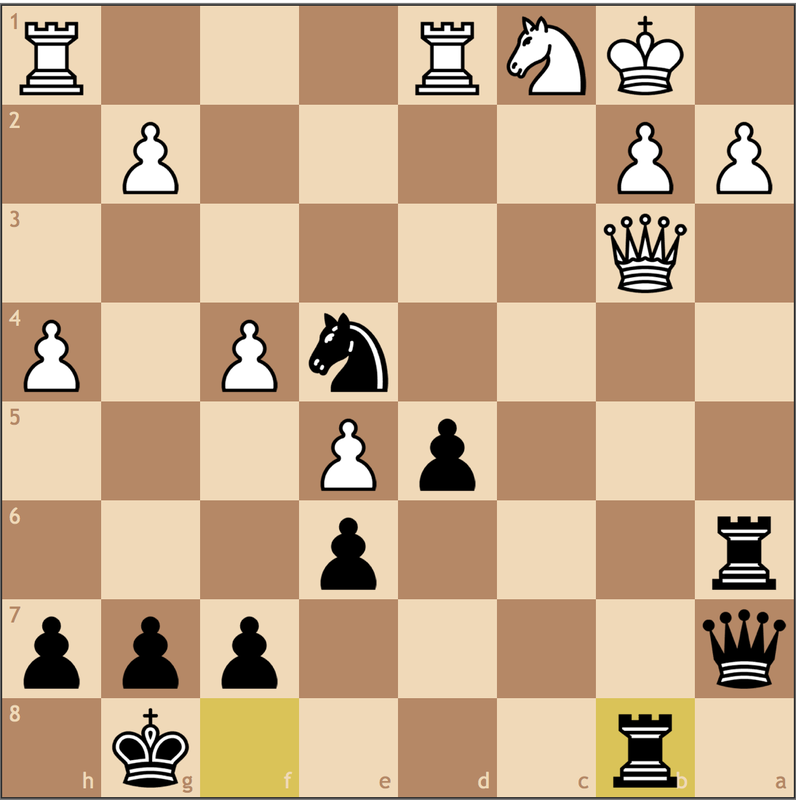 Black can play 2… f5 for a Dutch while avoiding the Staunton Gambit, but he can also transpose into Nimzo, Queen’s Gambit, and Queen’s Indian lines. In this game, Feliachi opts for the lesser known queenside fianchetto lines. While Black has given up the center, he has succeeded in reaching unfamiliar territory. White needs to proceed with caution, as the e-pawn will be a target for the b7 bishop. 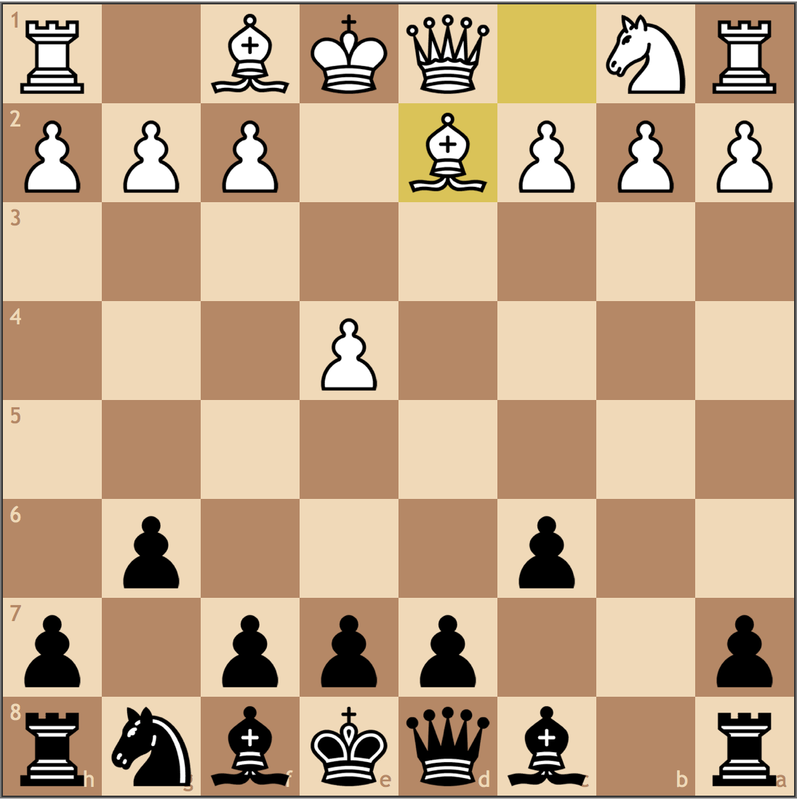 This move protects the pawn but seems dubious. Rea intends to push c2-c3 as he does later in the game, but delaying the development of his queenside army is not fundamentally correct. 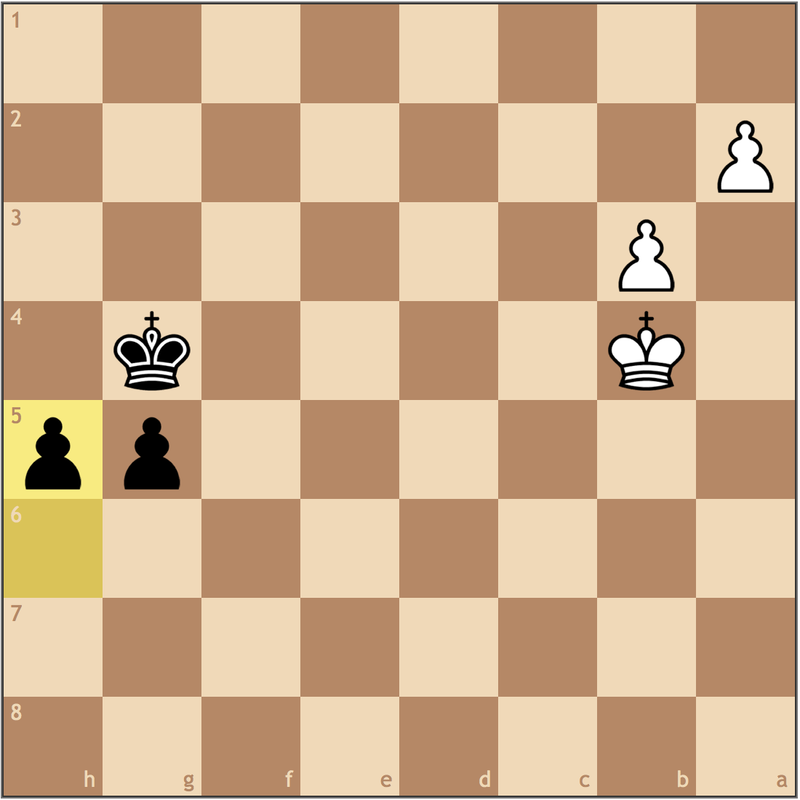 By pushing both of his center pawns forward, White conceded that both the e- and d- pawns may become potential targets. While it would be nice to play f2-f3 or c2-c3, White can’t afford to take away squares for his pieces to fight for the center. It was at this point in the game where I thought perhaps Black was slightly better. It’s not quite clear what the bishop on f4 is doing, but this now gives Black time to make his first push for the center. If White can castle and maintain his hold on the center, he will likely be equal or even better. However, Black gets an opportunity to intervene. 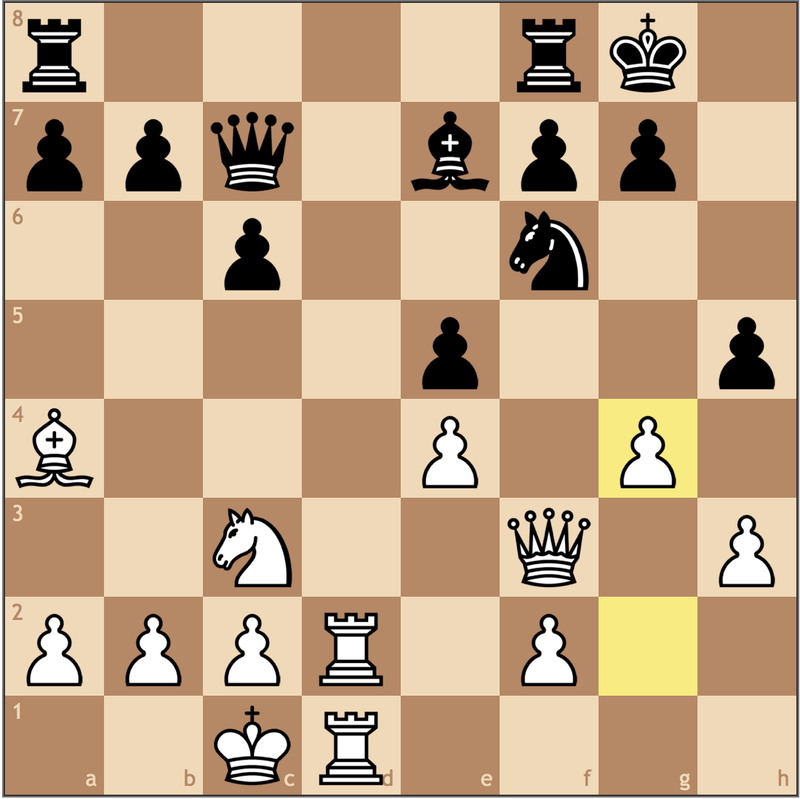 White’s piece development has centered around the ability to push c2-c3 to stop moves like …Nc6-b4 (attacking the d3 bishop). With his next move, Feliachi forces White to surrender the structural integrity of the queenside. The point of Black’s plan! White would have been better suited letting Black exchange on d3 to take control of the c-file. 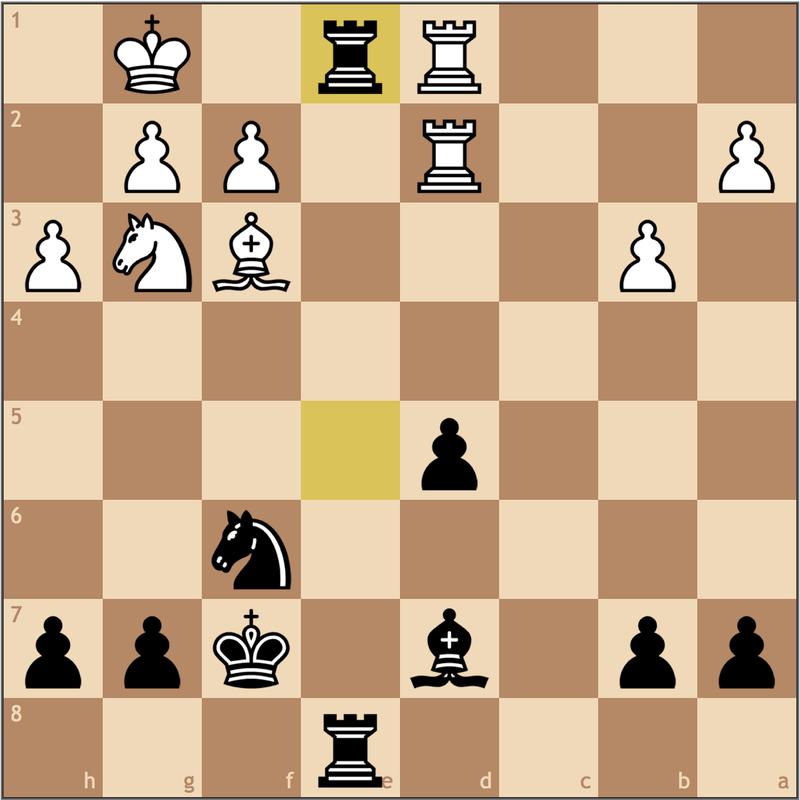 Black’s plan would be to push …d7-d5 in such position and seize control of the e4 square. 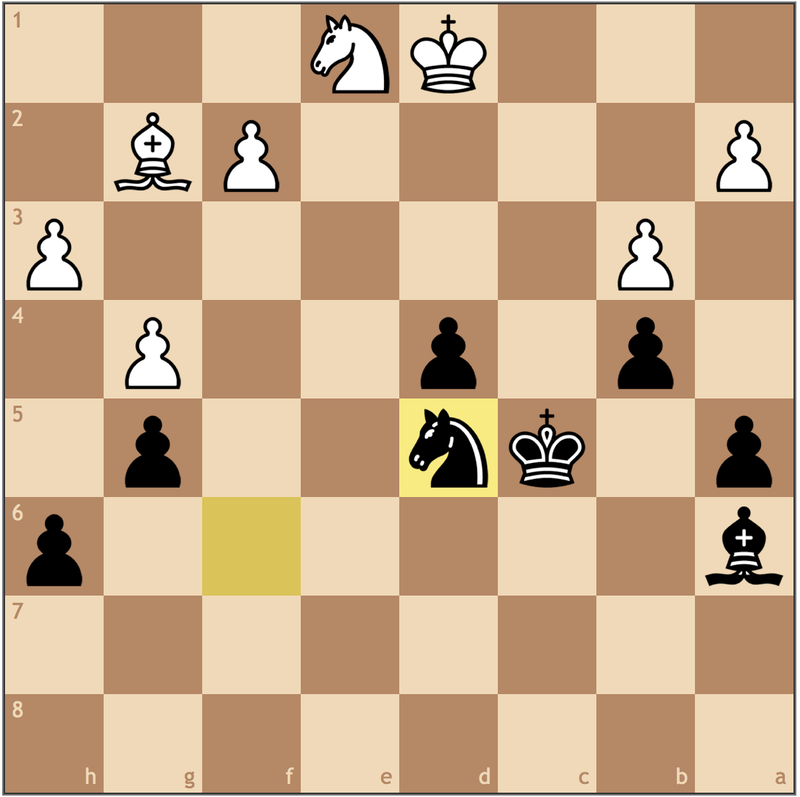 Endgames in those positions will favor the pair of bishops, so Black holds a slight advantage. Rea retreated his bishop to stay on the b1-h7 diagonal, but in doing so walks into the heart of Black’s plan. Now White is much worse because his king is stuck in the center of the board while Black’s rook will swing to c8 and expose White’s lack of coordination. 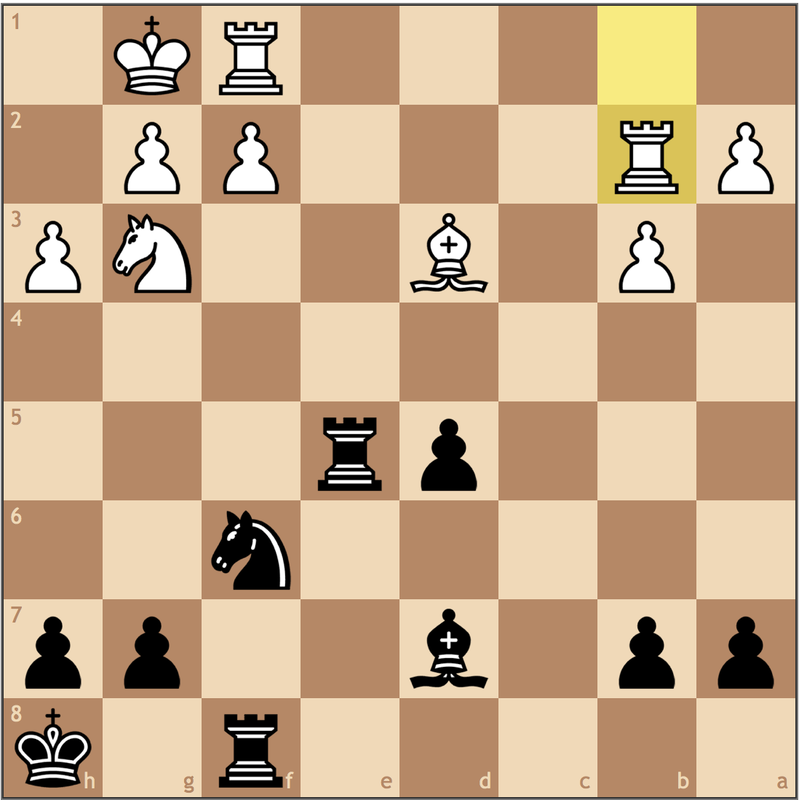 Black takes control of the 2nd file with added threats of …Be7-b4+ looming. 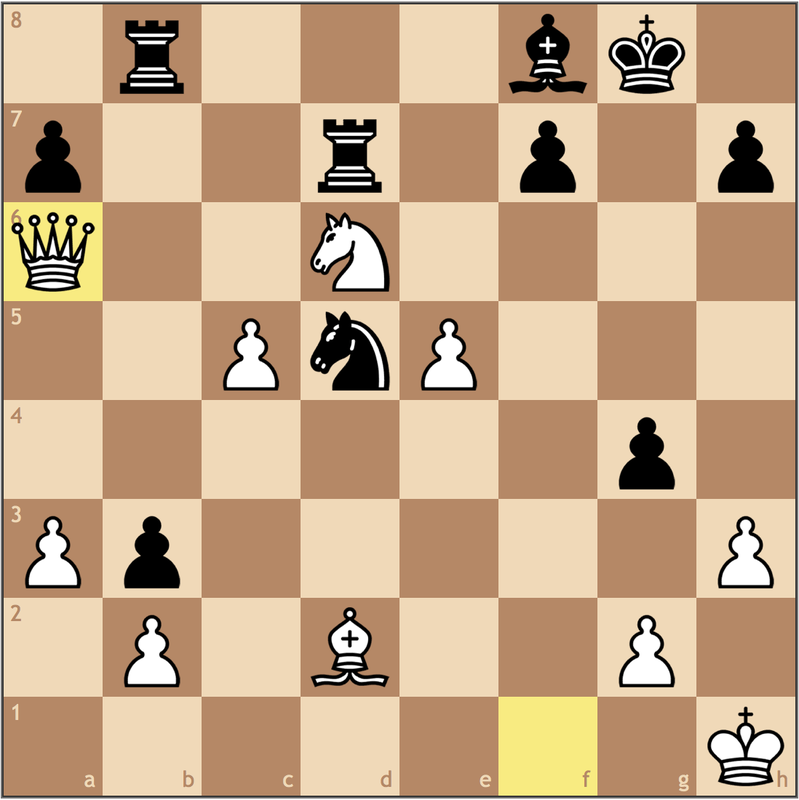 Uncertain of how to defend, White allowed Black to fork the king and queen on e2 and lost the game. I remember watching this game and being really impressed with Black’s ability to punish White’s desire to play c2-c3. 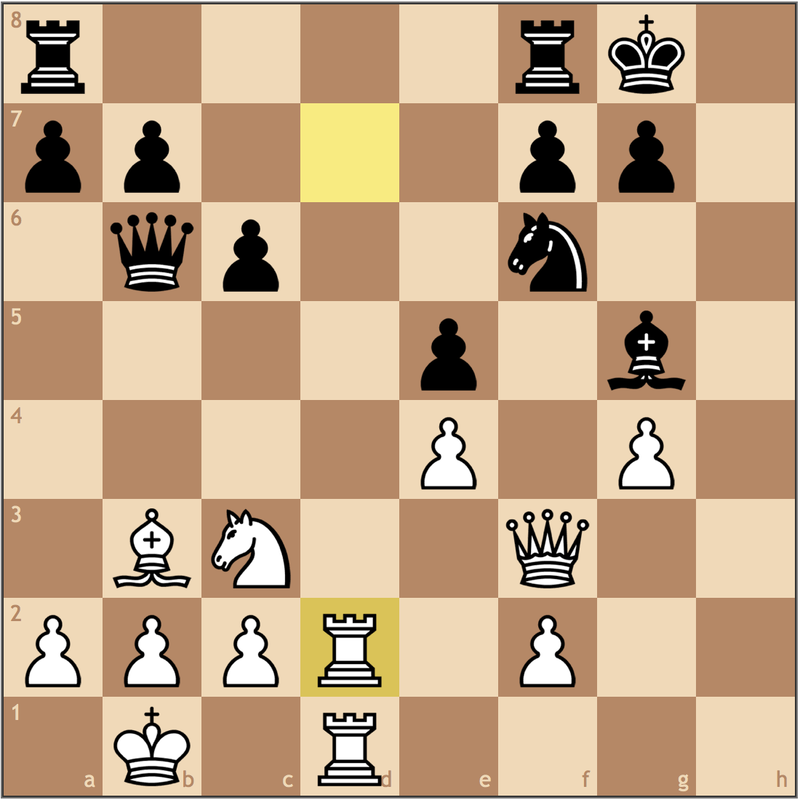 Though this …Nb4 and …Ba6 idea was clearly researched by Black before the game, it still made for a very instructional victory over a National Master. With this inspiring opening play out of the way, I figured I might as well share Richard Rapport’s game at the European Team Championships last Sunday for team Hungary in their match in France. At only 19, Rapport has established himself as one of the world’s elite, specifically for bizarre opening preparation. In his game against Fressinet, he chose to open his game with 1. f4, giving the Bird’s Opening a rare showing at the Grandmaster level. Since Gibraltar last January, 2015 hasn’t been the kindest to the Hungarian. Now under 2700 again, will the European Team Chess Championships allow Rapport to turn the page? Having worked with 1. f4 players before, this is not a move I’m too familiar with. 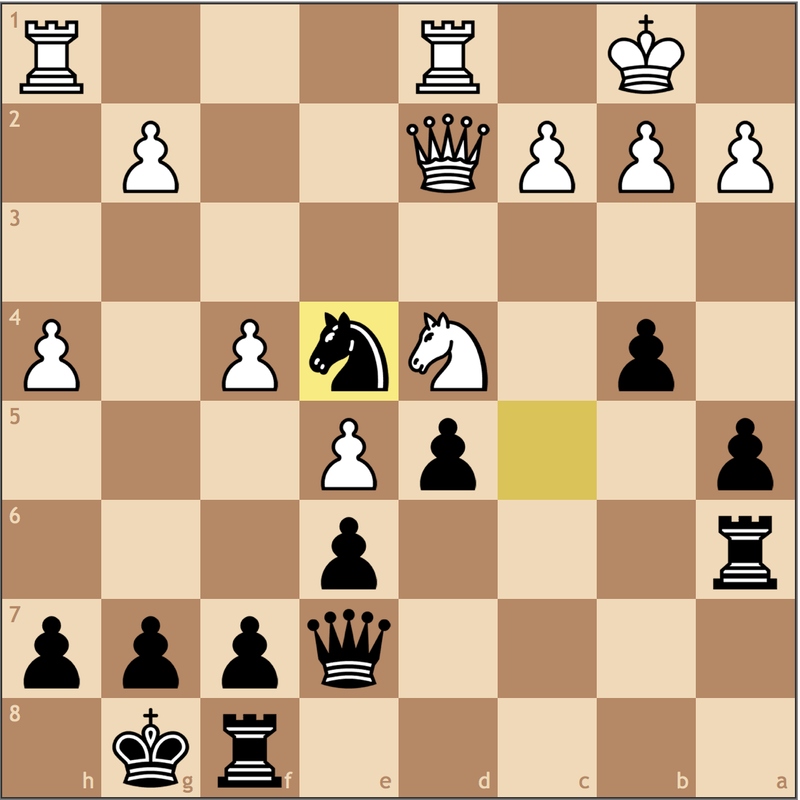 White offers the c-pawn to gain central control, and if Black doesn’t take, the c-pawn puts pressure on Black’s center. That being said when Black plays …Bg7, it will be difficult for White to blunt the diagonal, thus offering Black some play. 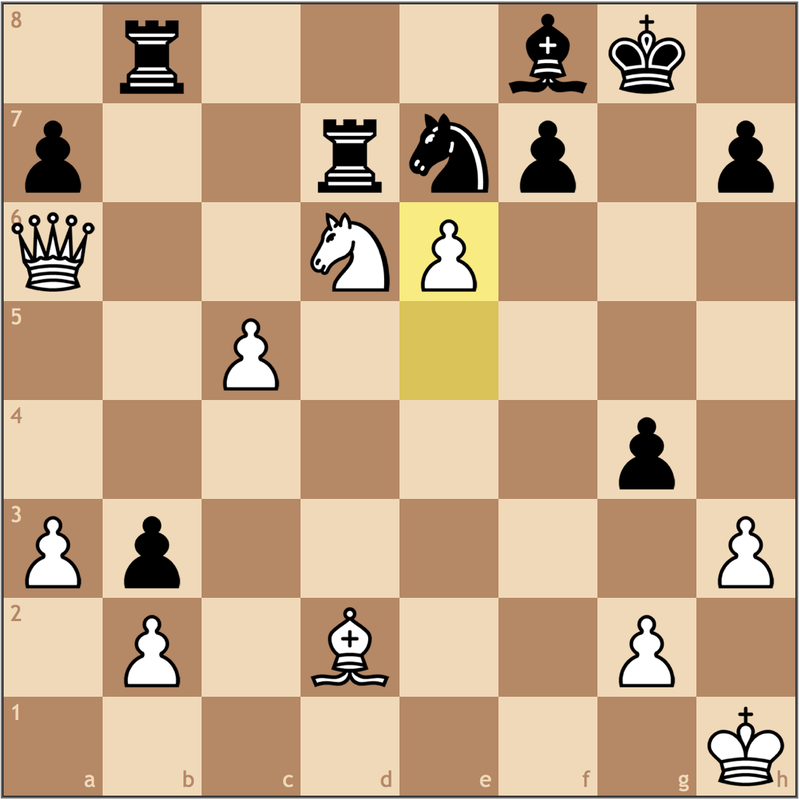 White’s structure now represents a flipped Botvinik set-up, where White will hope to use his control of the e5 square and his space to acquire an advantage. 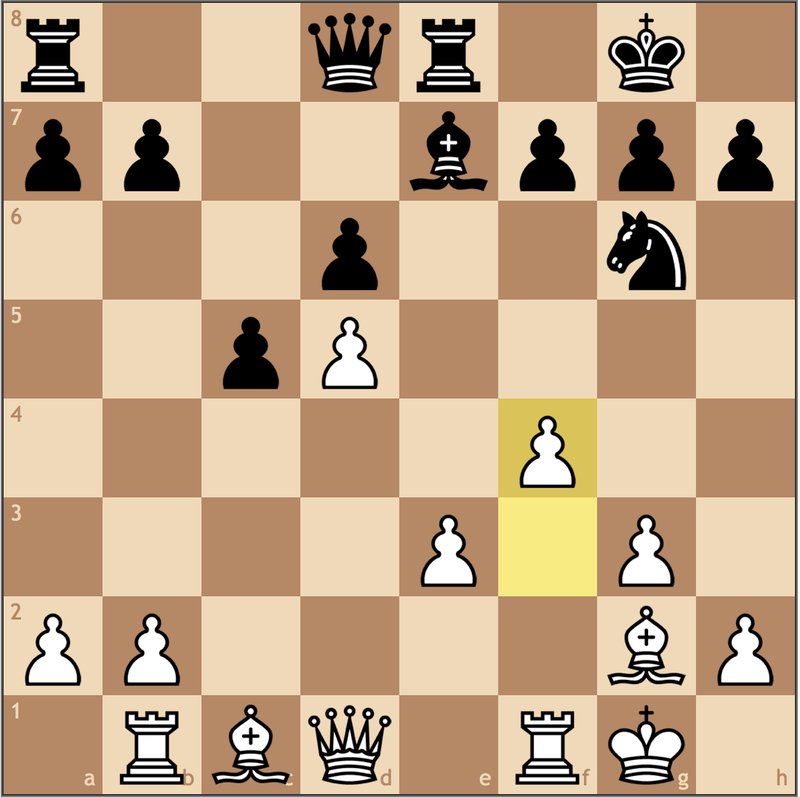 With this move, Rapport fills the “hole” in his structure on e4 while taking away Black’s strong point, d5, as a potential outpost. While this takes a tempo for having moved the pawn twice, the burden is on Black to find a way to develop his bad c8-bishop. Despite this game’s awkward beginnings, it seems like the balance has already shifted slightly towards White. 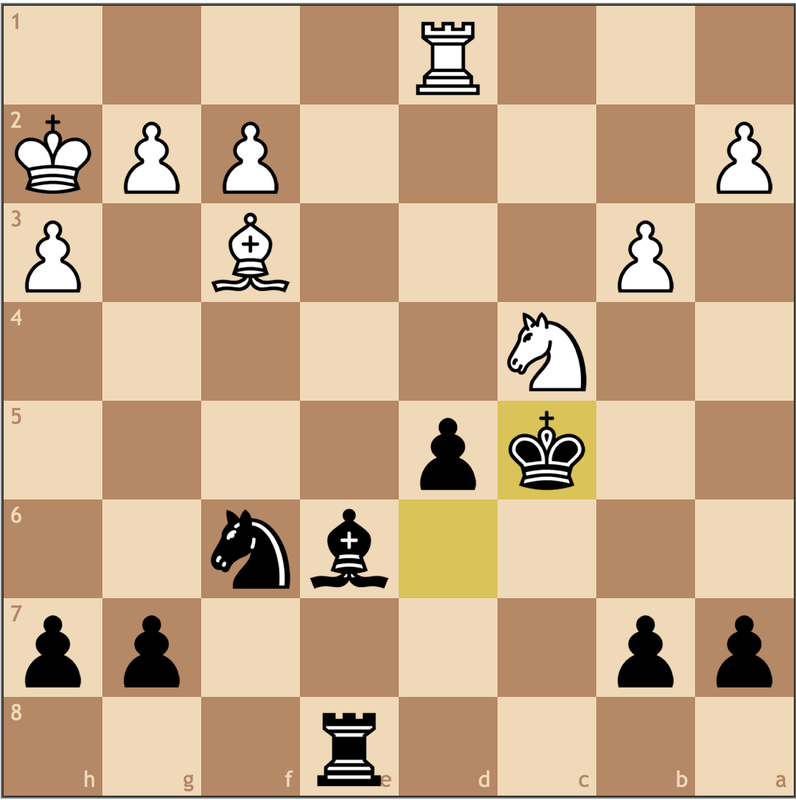 Black has found a way to develop his bad bishop on the long diagonal, but not without consequences. 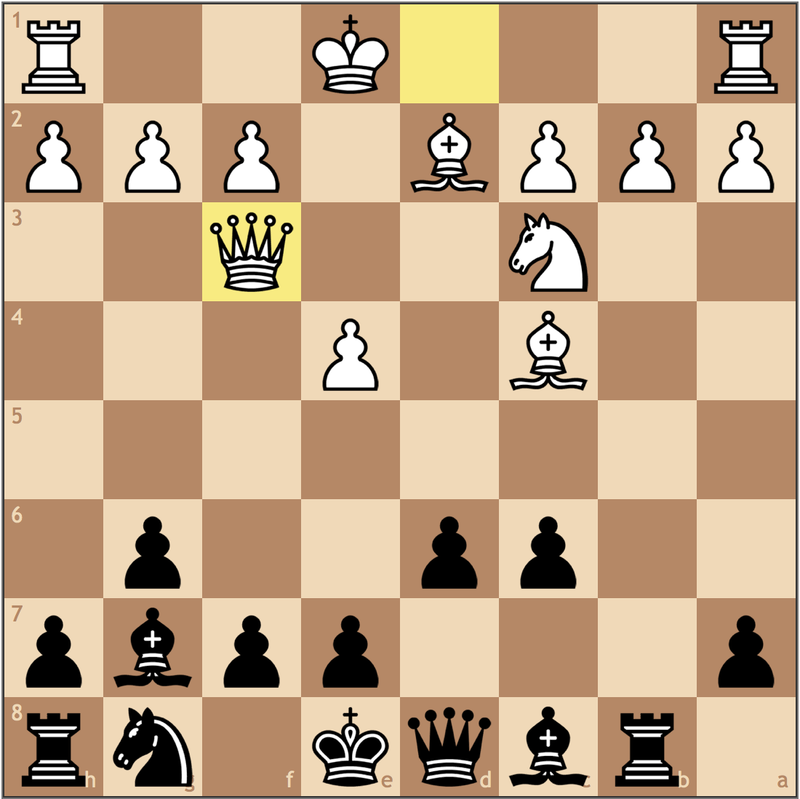 Already with a hyper-extended b-pawn, Black must now also worry about the d6 square. While this e-pawn push from Rapport gives up some light squares, he locks in the g7 bishop, making the dark squares hard to defend. A prophylactic measure. At some point, White will want to play Ne4-d6, and this move allows him to do so as the king will no longer be exposed along the a7-g1 diagonal. While Black currently has better development, Fressinet struggles to play around Rapport’s Bind, as there’s no clear plan for Black. 18…Ba6 19.a3 Bf8 20.Bxa6 Qxa6 21.Nd6 Rc7? 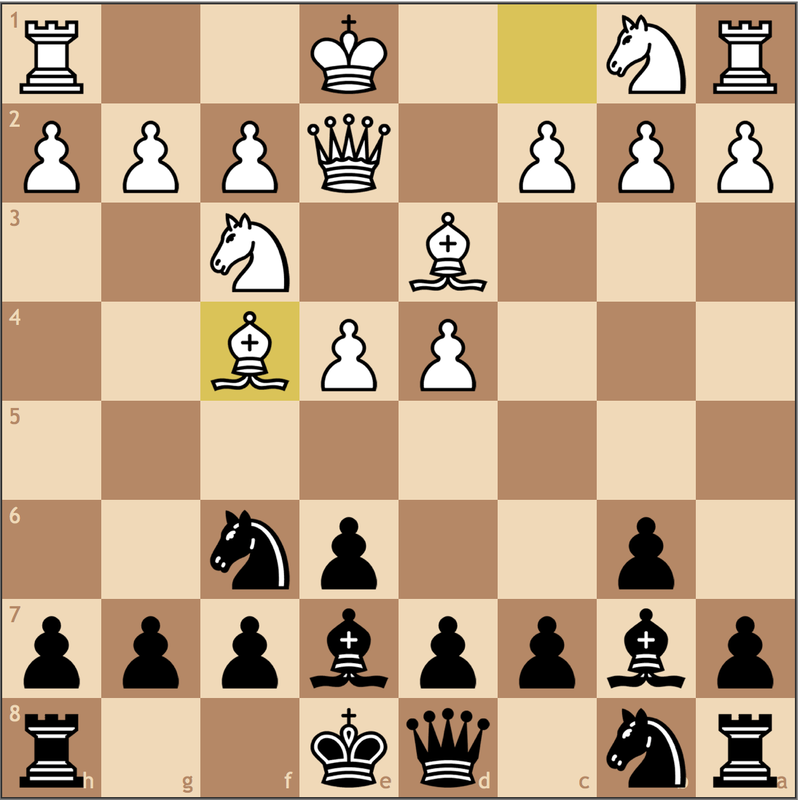 This move confines Black to passivity, as playing …Bxd6 would have been better. Fressinet must have feared the protected passed pawn on d6, but the bishop on f8 really doesn’t add value to Black’s set-up. 21… Rxc5? doesn’t work because 22. axb4 Qxa1 23. bxc5 and Black’s queen is awfully misplaced in the corner. 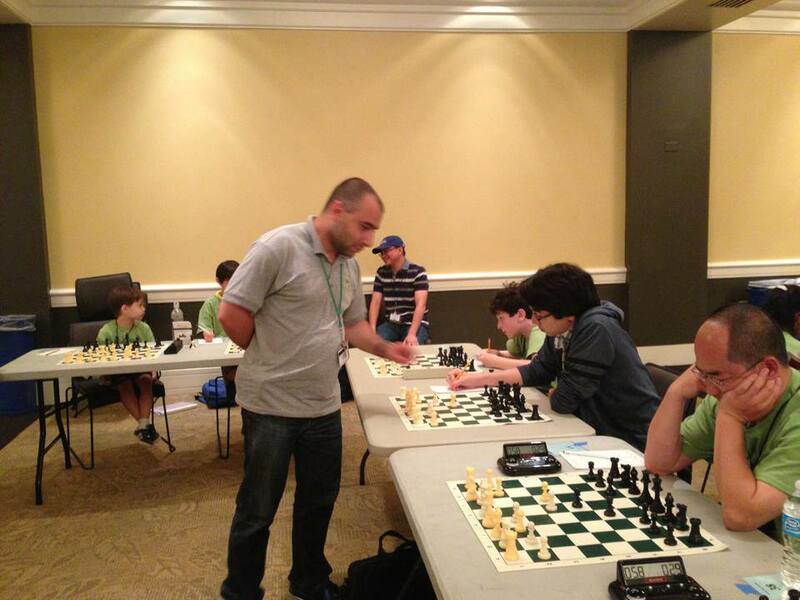 Grandmaster Iossif Dorfman states that dynamic play stops when the attacking player has a static advantage. Here with a knight firmly planted in Black’s territory, White can finally complete his development with ease. 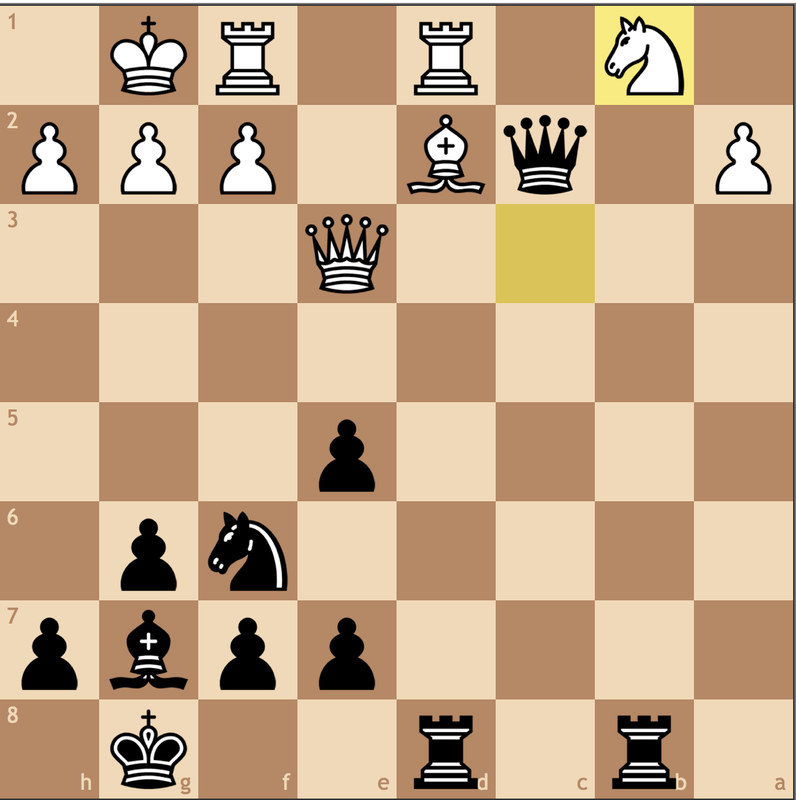 This sequence shows how poor Black’s position really is. 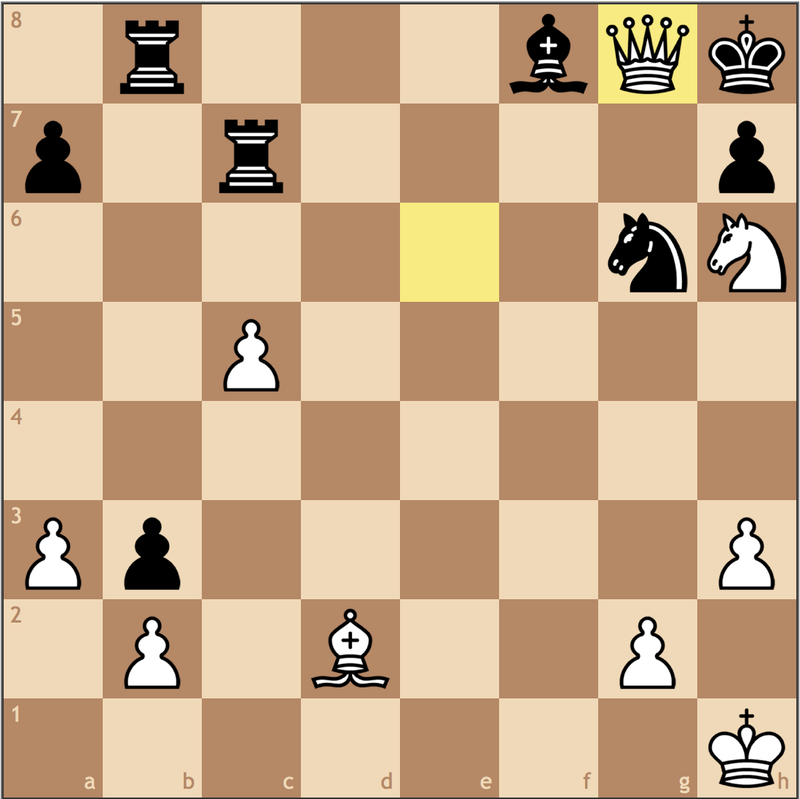 Unable to generate counterplay or stop White’s improvements, White has already strategically won, the rest is just technique. 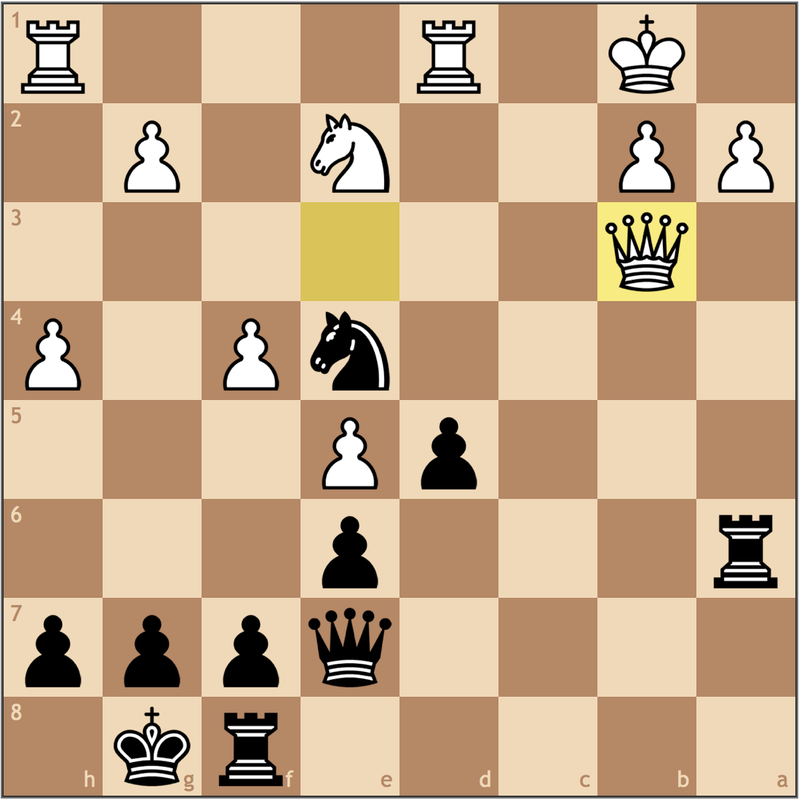 Two rooks are generally better than a queen, but here Rapport also weakens Black’s queenside. 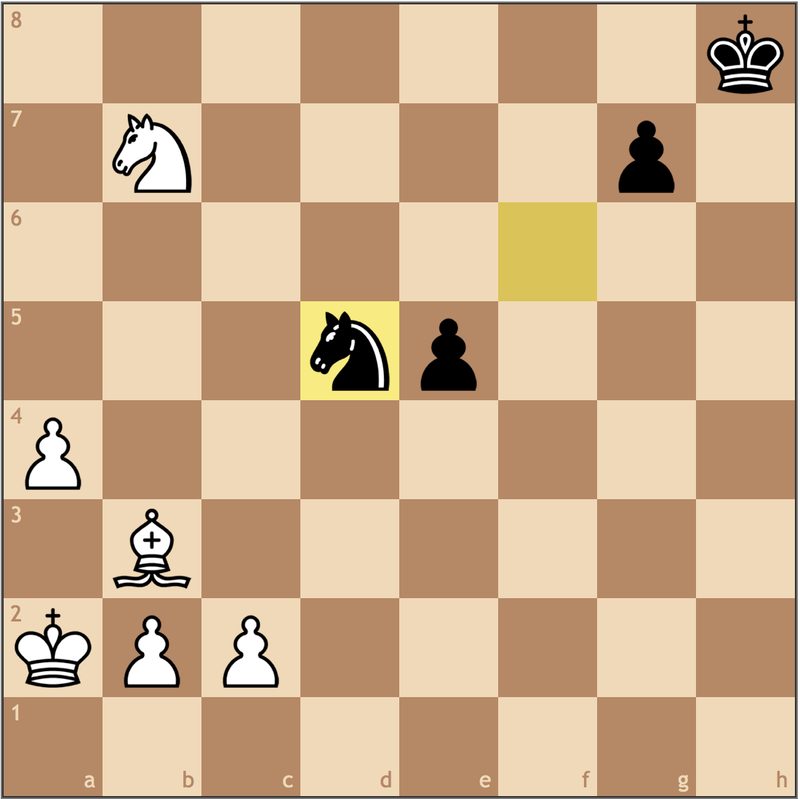 With Black’s rooks out of reach from the king, White is left with the task of attacking a defenseless king. A very instructive moment from Rapport! Sometimes, if you can’t solve a position, it’s important to try changing the move order. If White had just tried 33. Qa4 Rc7 34. Qxg4+, after 34… Bg7, it’s unclear how to proceed. 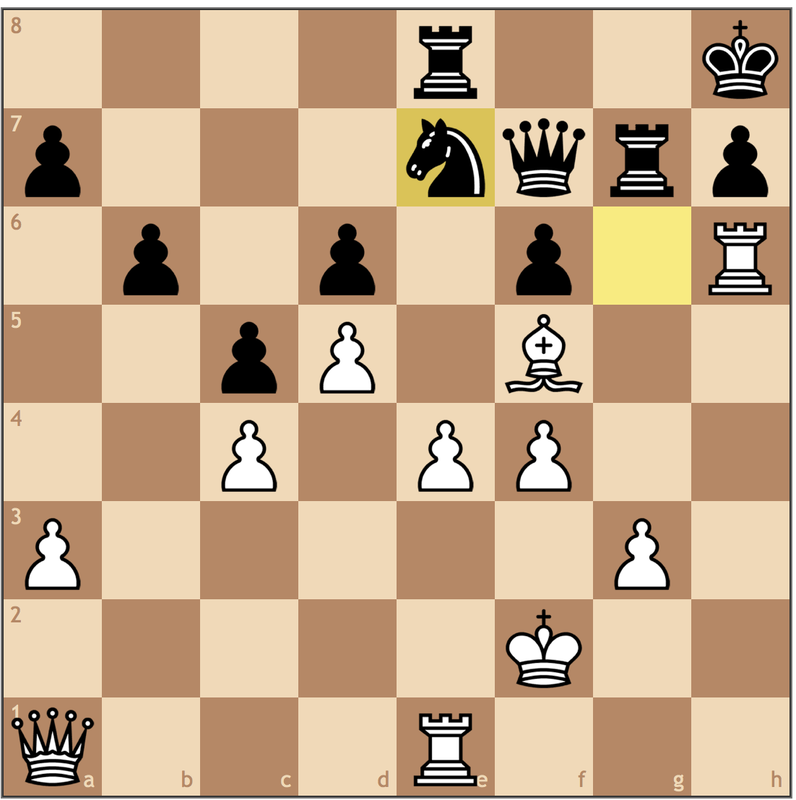 Now with this move, White offers a pawn so that after Qxg4+, the queen can follow up by taking on e6, infiltrating the Black camp. Out of gamesmanship, Fressinet allows Rapport to deliver a checkmate after a long day in the office. A great performance from Rapport, as his result was critical in securing a tie with the French in Round 3. After 4 games, Rapport has secured 3.5/4 for the Hungarian team in the European Team Chess Championships. Make sure to check out other games from the event, as there have already been several heavyweight clashes. After Russia’s dominating win over Ukraine, will they be the favorites to run away with the event, or can Azerbaijan or Armenia catch up to the leaders? You can visit the event webpage here. After losing to Maxime Vachier-Lagrave, Aronian rebounded with a big win over reigning World Champion Magnus Carlsen and team Norway. The Armenian has had the most difficult schedule, as he fell to Michael Adams in round 5. For today’s post, I would like to show an online game that shared with me from a young player out of Virginia Beach. If you too would like your game analyzed by me, make sure to send them to chess.summit@gmail.com, and I’ll feature it in the next post! Even though I’m not a 1 e4 player, this move cannot be the most accurate way to handle a Philidor. 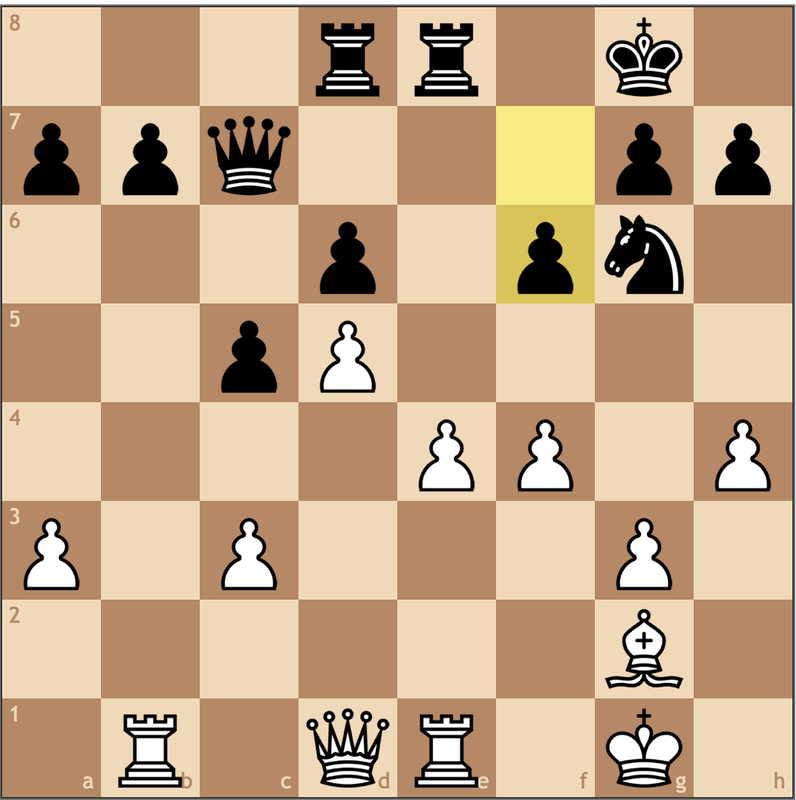 White invites Black to attack the b5 bishop while creating a hold on the center. Remember, the only reason why 3. Bb5 is a strong move in the Ruy Lopez is because when Black has a knight on c6, it becomes uncomfortable for Black to move the d-pawn. 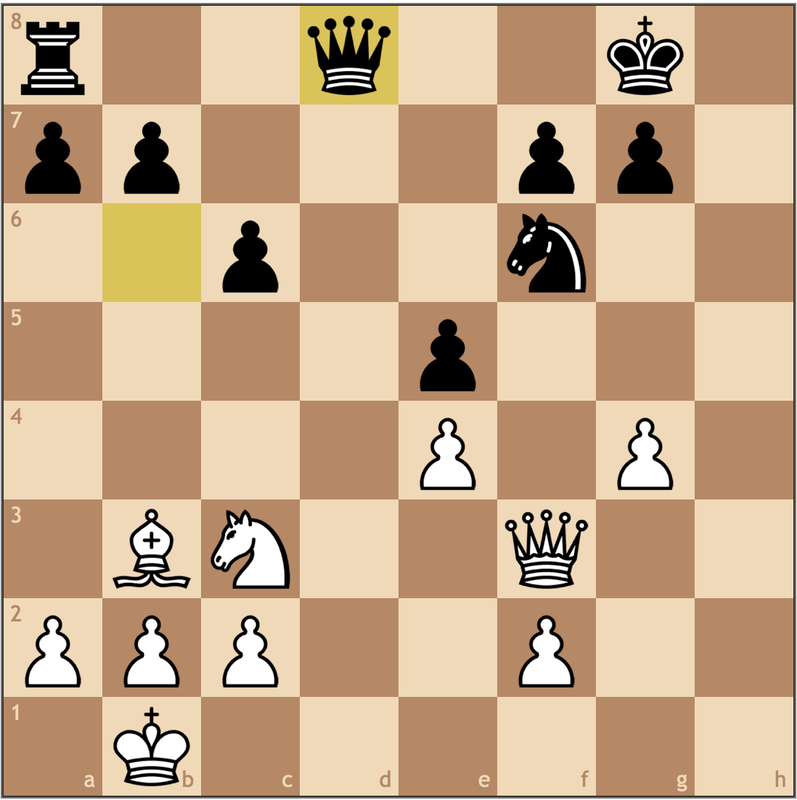 A general idea to remember is that its not worth checking your opponent if you cannot also improve your position. 3…c6 4.Ba4 Nf6 5.d4 Bg4 6.h3 Bh5 7.dxe5 Bxf3? 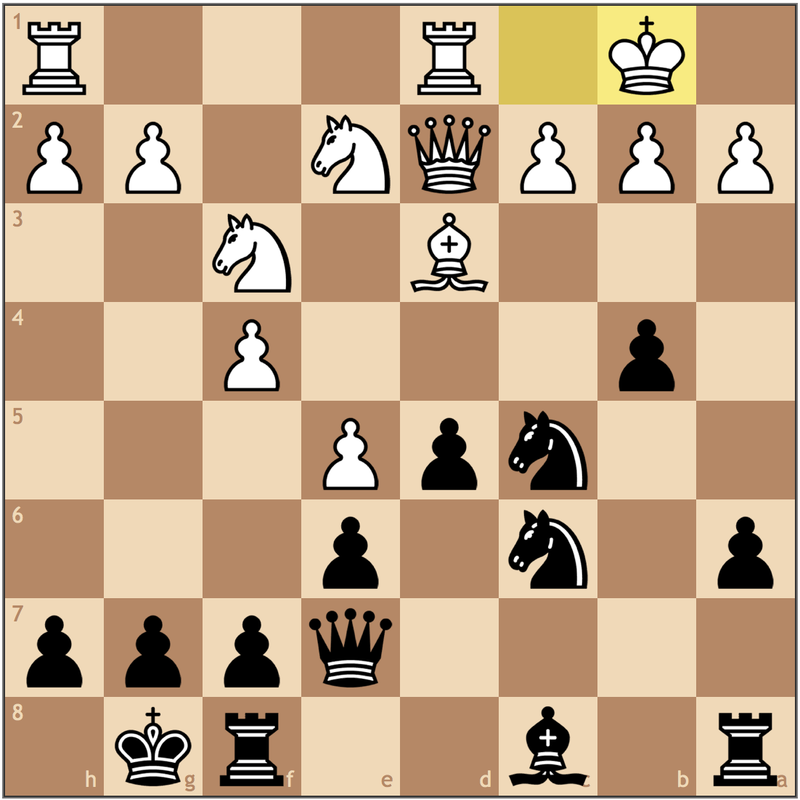 This move deserves a question mark because it defeats the purpose of Black’s last move, 6… Bh4. 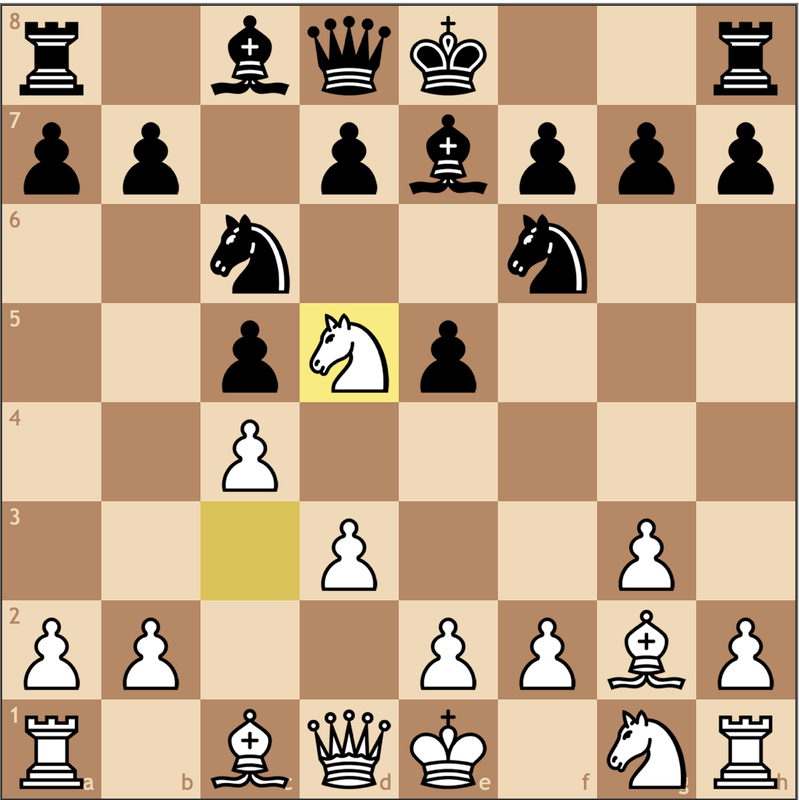 In general, If you play a move like Bg4/Bg5 to pin the knight, you need to be ready to take the knight should your opponent attack your bishop with the h-pawn. By not following this concept, Black lost a critical tempo to develop. 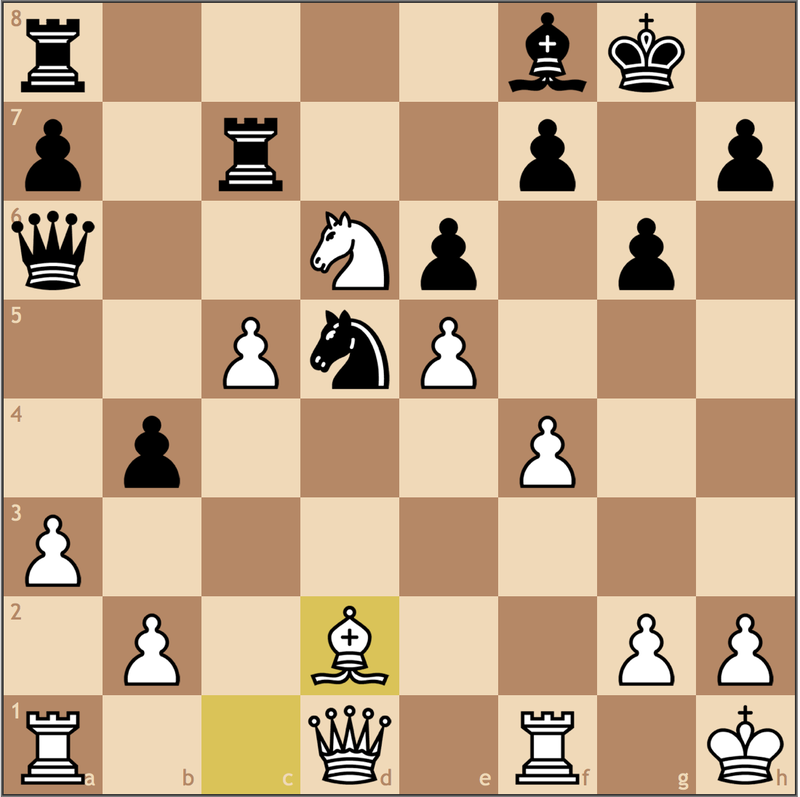 8.Qxf3 dxe5 9.Bg5 Be7 10.Nc3 Nbd7 11.O-O-O Qc7 12.Rd2 h5? A strategic mistake! With this move, Black makes it much more difficult to castle kingside while also making it more difficult to kick the g5 bishop. 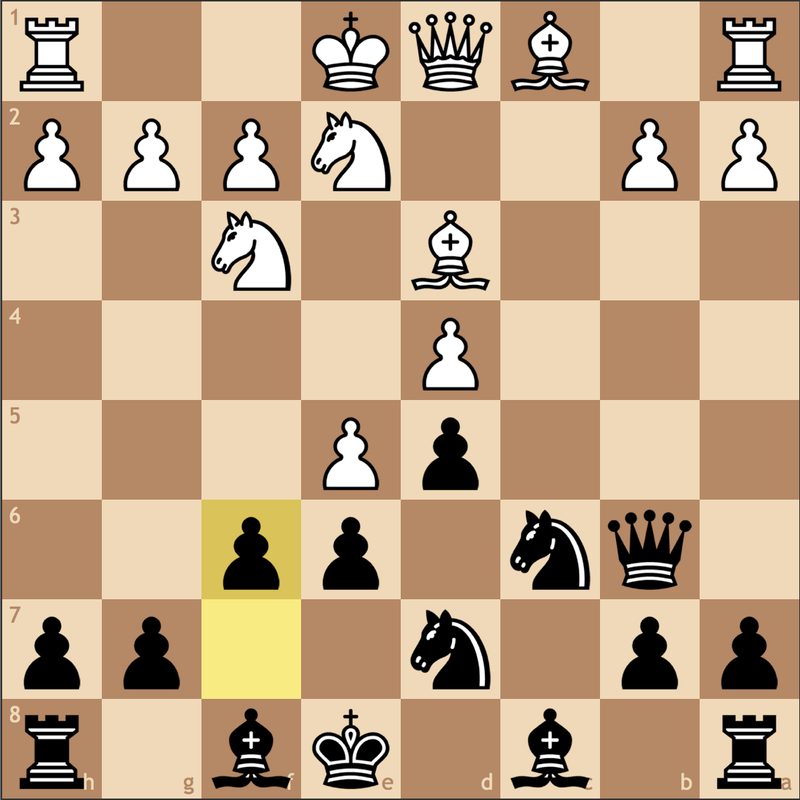 Black should have considered 13… Ne5, attacking the a4 bishop. 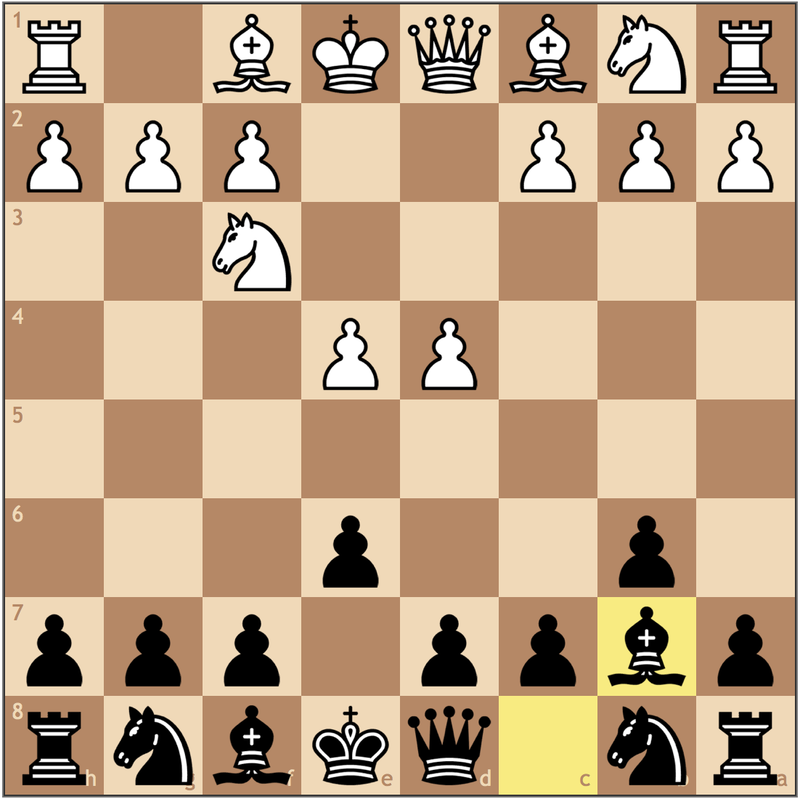 Black’s intention should not be to trade for the light squared bishop, but to castle kingside and contest the d-file – specifically the d4 square. 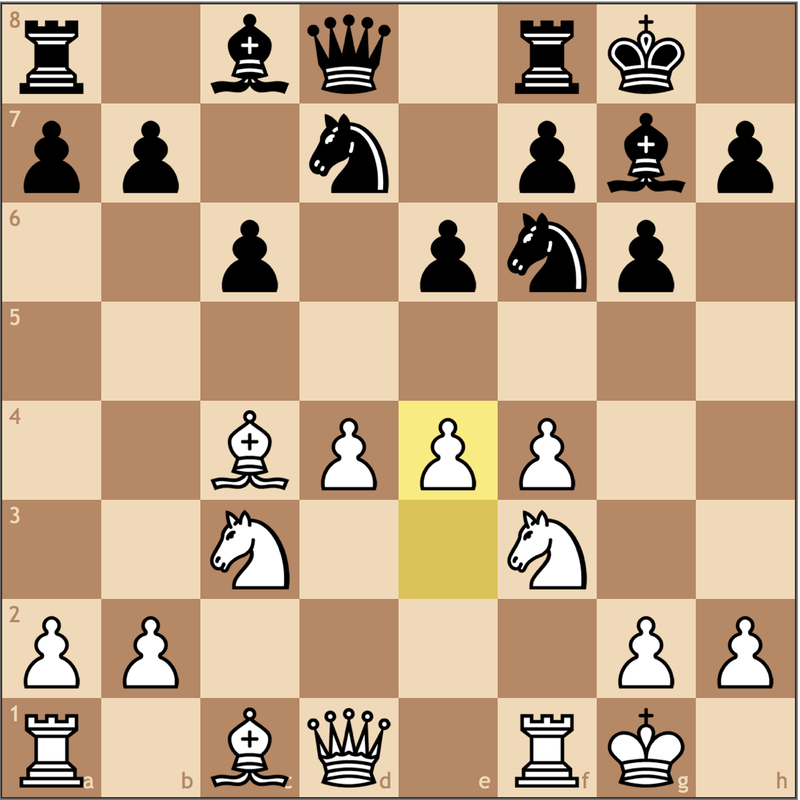 From c5, the knight can always trade for the bishop, but for the time being, it would put pressure on the e4 pawn. 13.Rhd1 O-O 14.Bxf6 Nxf6 15.g4! Good technique! 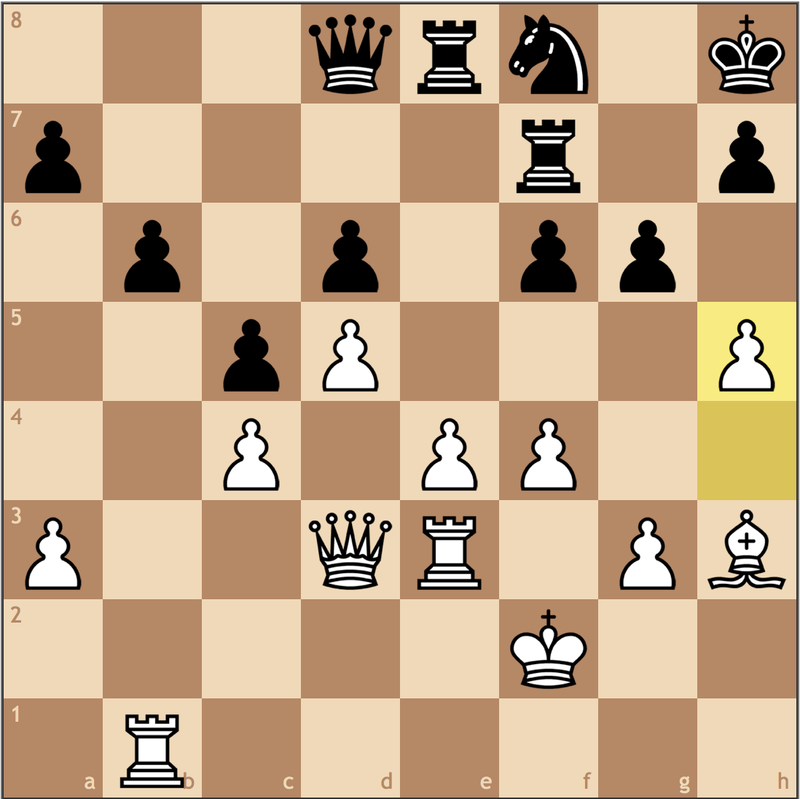 White punishes Black for having a poor kingside structure, and plans to make use of the weak d7 square. 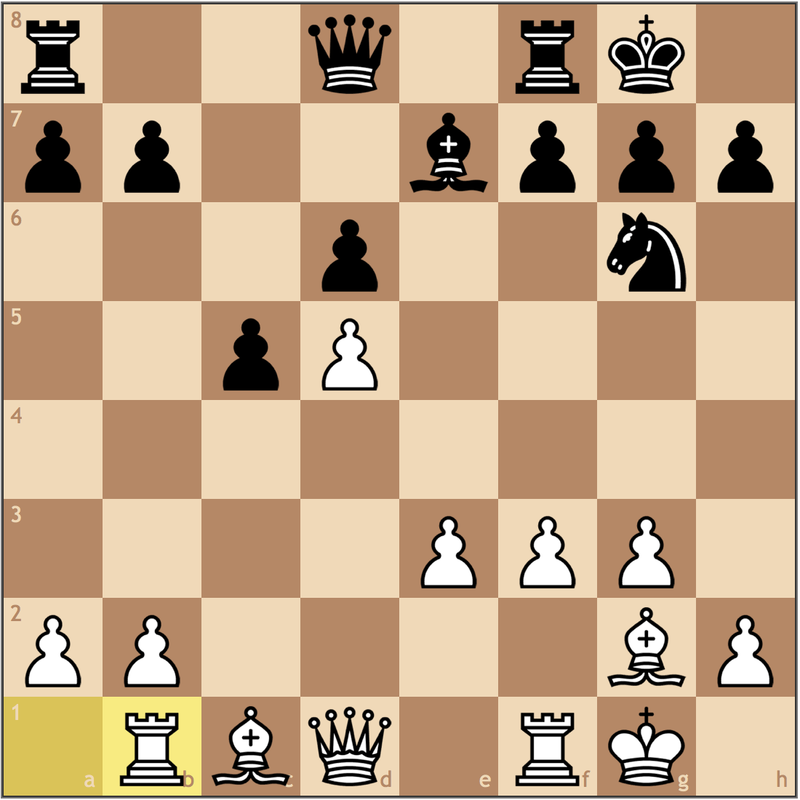 15…hxg4 16.hxg4 Nh7 17.Rd7 Bg5+ 18.Kb1 Qb6 19.Bb3 Nf6 20.R7d2?? I give this move two question marks for the thought process that went behind it. In his email to me, White explained: “I sac the rook since that bishop was worth 5 to me since it was blocking my pawn and aiming down on the king side”. This thought process is incorrect for a couple reasons. 1) This move is a passive tactic, meaning that the entire line assumes that Black will willingly take the rook, when in reality a move like …Ra8-d8 can be played. Such moves need to be considered for this move to work. 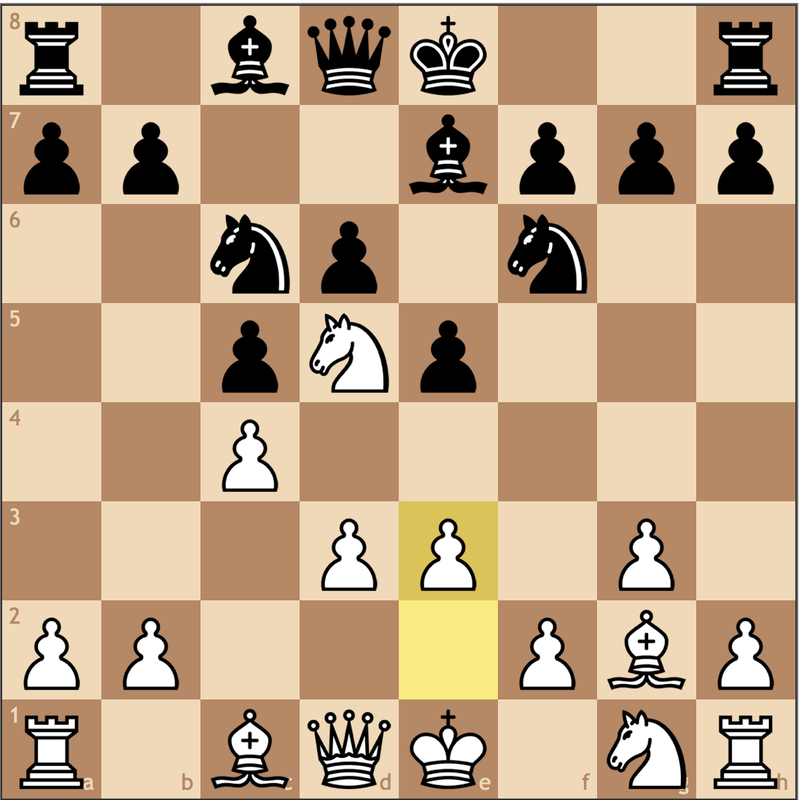 2) The bishop on g5 is actually a really bad piece. 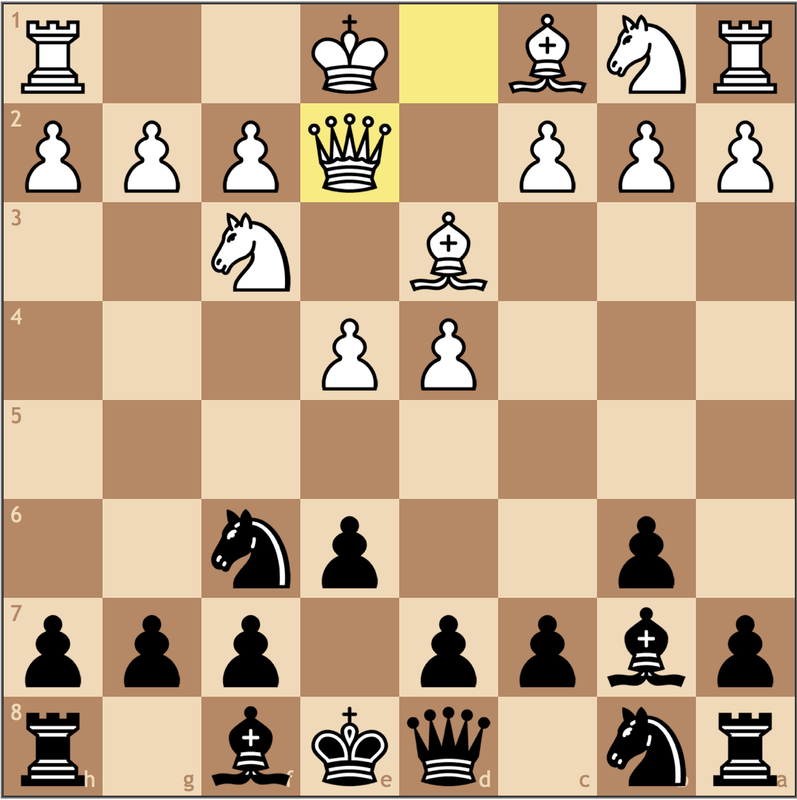 The weakest square on Black’s kingside is h7, which the dark square bishop can never protect. 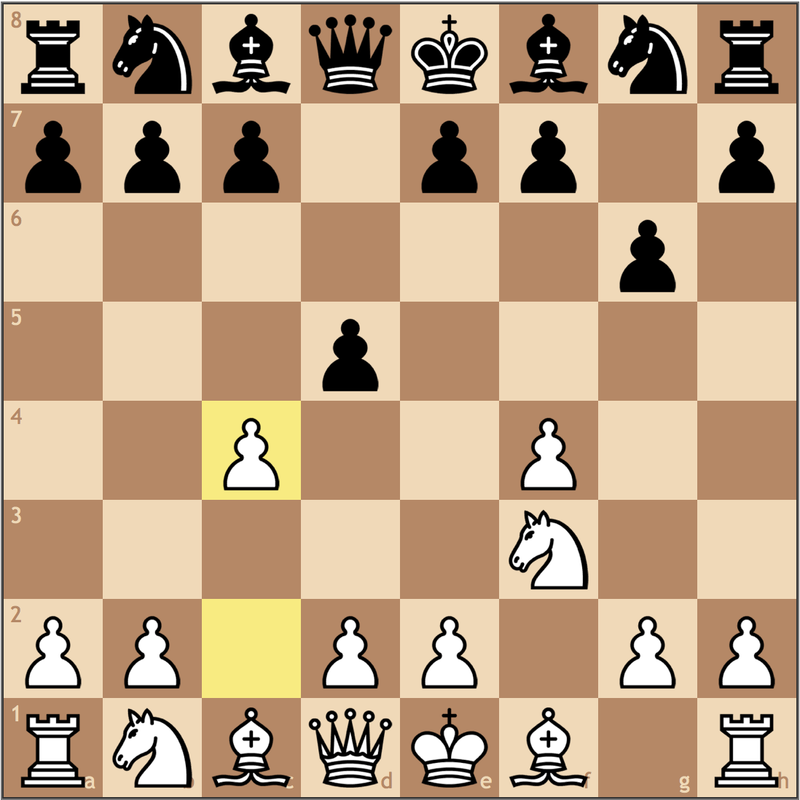 Furthermore, should the bishop move, it risks allowing the g5-g4 push. If a rook was to be sacrificed, why not for the f6 knight? 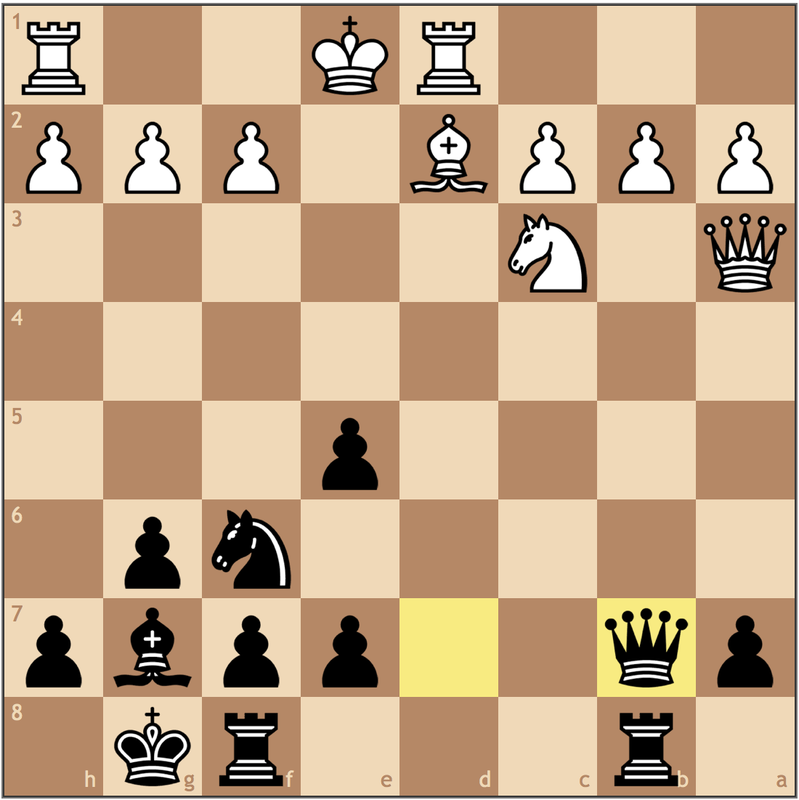 At least its a much more active defender and covers Black’s critical squares. A sample line would go 20. Qf5 Nxd7 21. Rxd7, and Black now has to deal with pressure on f7 and a g-pawn push. White is winning. 3) Using point values to calculate generally leads to really artificial play. Even though we are taught each piece’s point value when we learn how to play, these are merely heuristics for computer engines and constantly change based on the position. In general, don’t compare point values, compare actual value to the position. 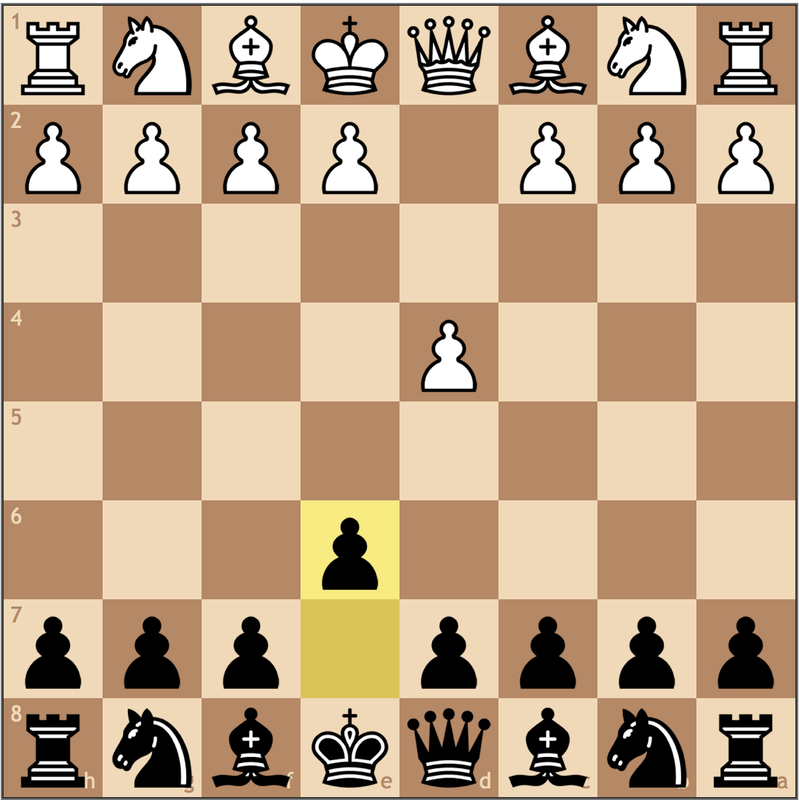 Either way Black recaptures is losing, but Black should have recaptured with the rook to have one more active piece in the game. The try …g7-g5 might not be inconceivable here. 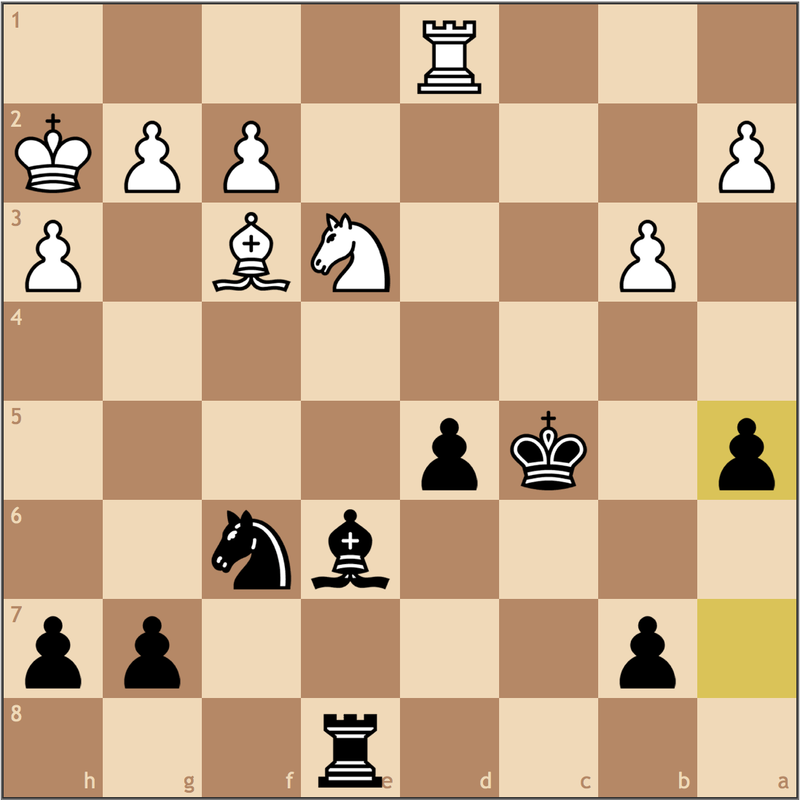 Already in a worse position, Black can seek counterplay using his one passed pawn. 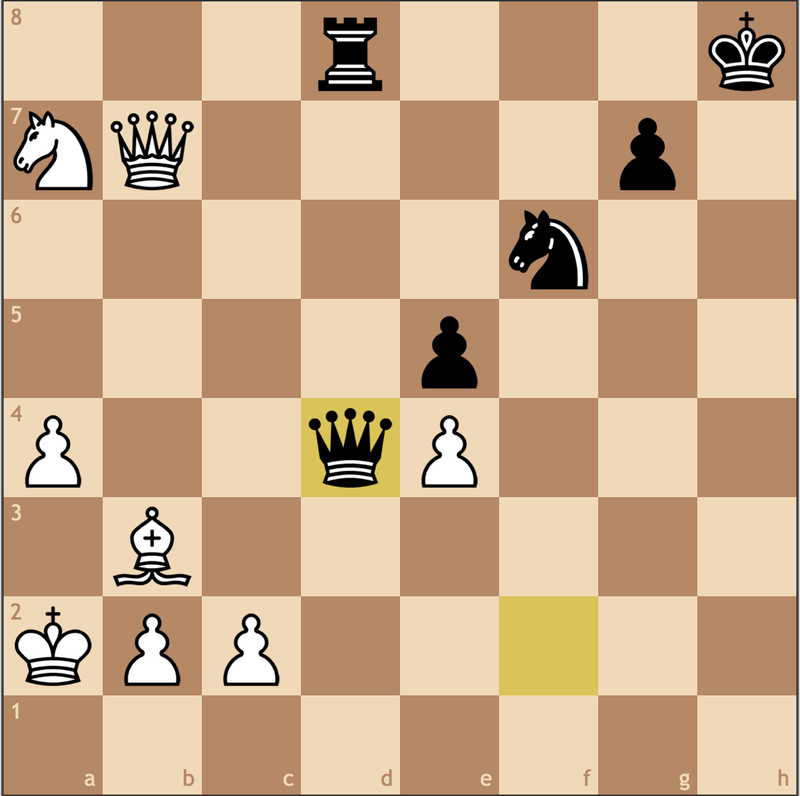 An unfortunate blunder, but White is already winning the endgame. 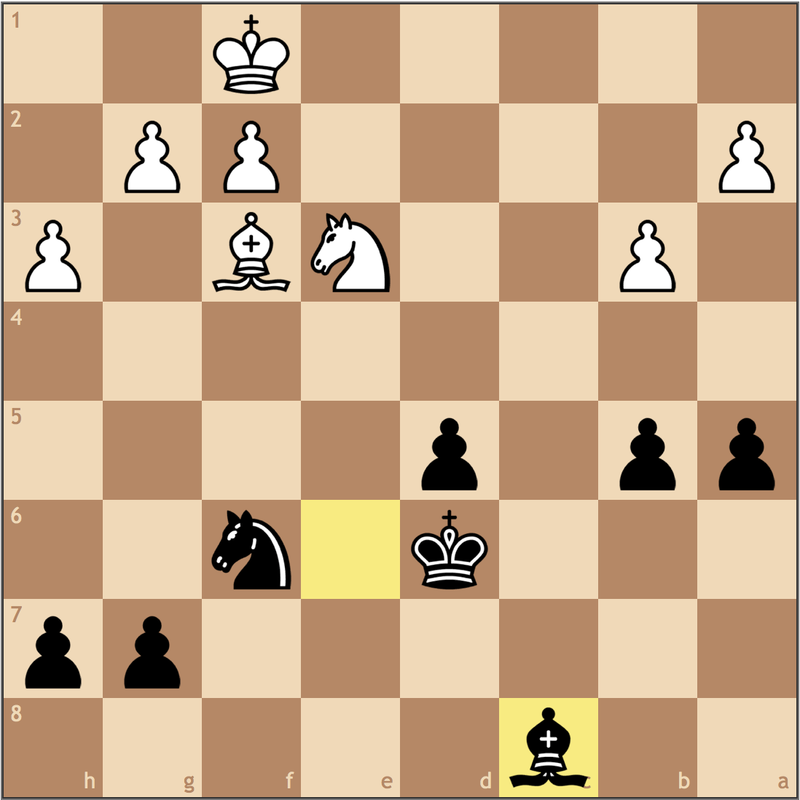 Again Black needed to make the position as complicated as possible by pushing the g-pawn and hoping for the best. 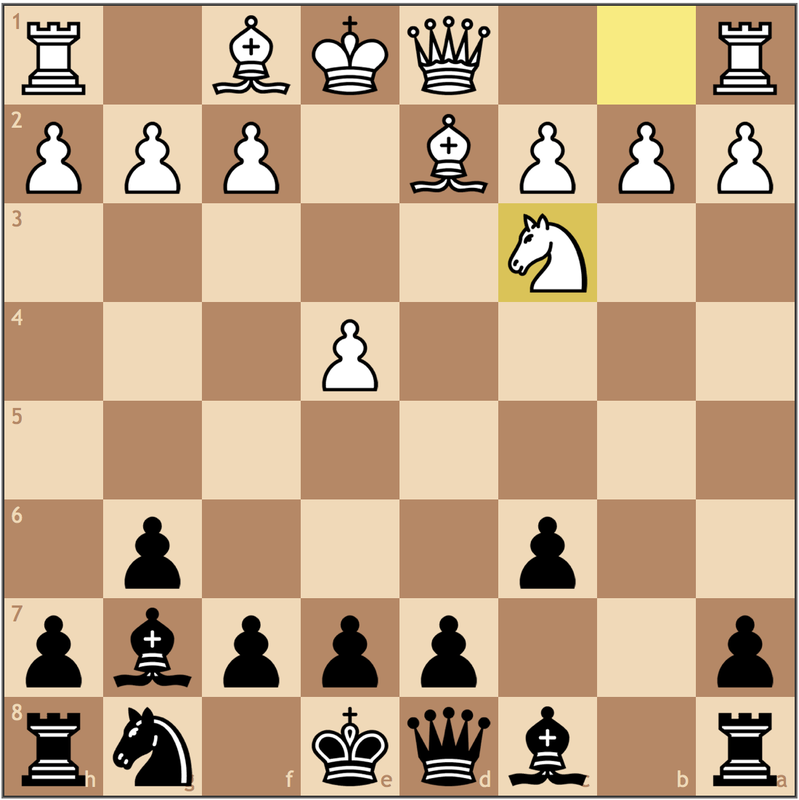 Black blunders on the final move, ending the game. “Patzer see a check, patzer play a check” – In this game, White lost time with an early Bb5+ when a move like Bc4 would have been much more practical. Only check your opponent if it helps you make progress. Don’t weaken your own pawn structure! – The move 12… h5 alone may have cost Black the game as White had a lot of counterplay as a result. Look for ways to activate your developed pieces once you’ve finished the main opening ideas. Don’t consider point values when analyzing – Trust your own intuition when calculating the differences in piece value. Knowing that a piece covers key squares and another piece serves little to know function might be enough for you to make rational over the board decisions. “When you are losing, go crazy!” – This was something one of my former coaches taught me when I was ~1800. If you are worse in a position, you have to seek counterplay and contest your opponent’s desires. 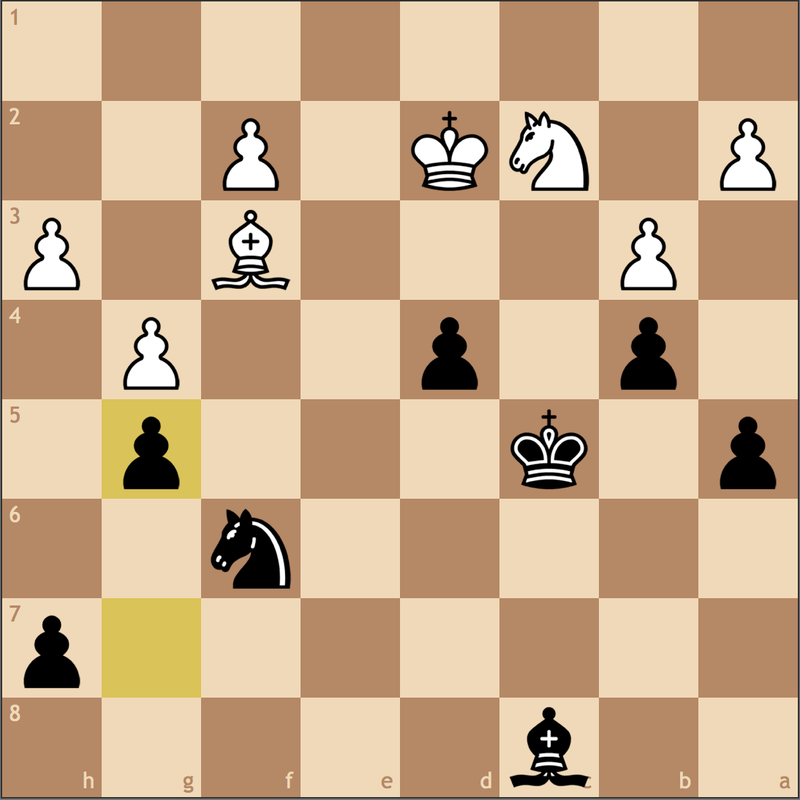 Black failed to make a serious push for the advantage in the endgame and thus failed to stay in the game. Simply making his g-pawn promoting a threat may have helped him get back to a more tenable position. I’ll be looking forward to more game analysis posts in the future! Send me games!